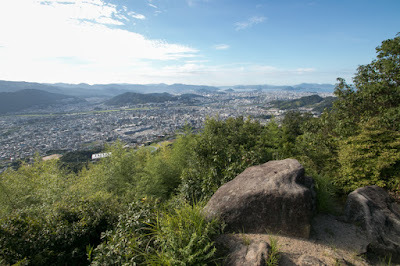 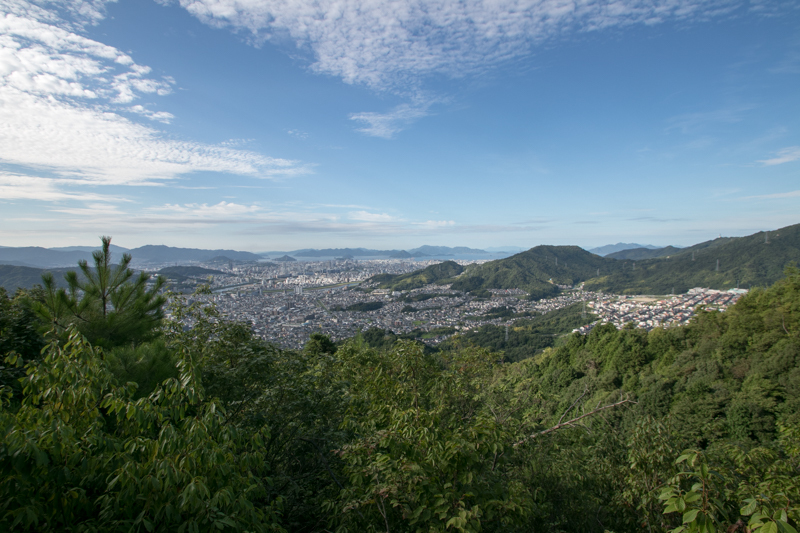 Sato Kanayama castle (佐東銀山城) is built over Takeda-yama mountain, one of about 400 meter height from hillside at the north edge of line of mountain spreads at the west side of Ota-gawa river for 7 kilometer, which is sometimes called as Hiroshima Alps at Hiroshima city. 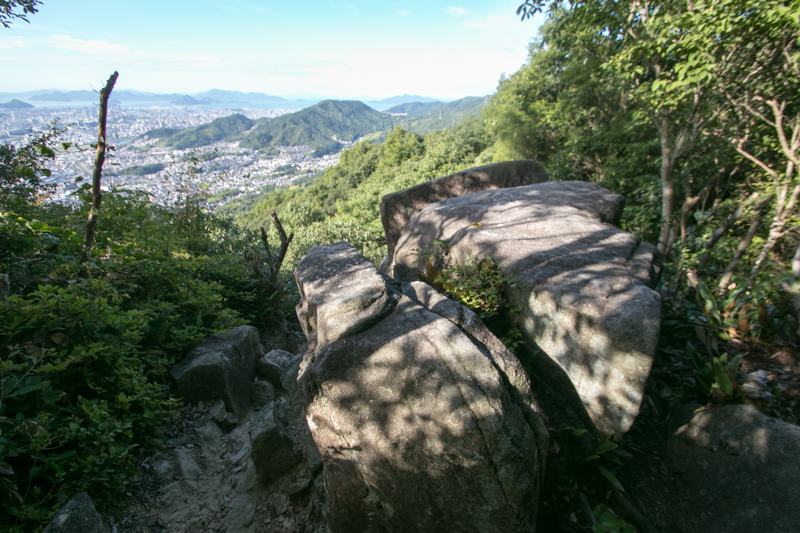 As the line of mountain slightly curved eastward at Takeda-yama mountain, this mountain has spectacular view of 270 degrees for northward, eastward and southward. 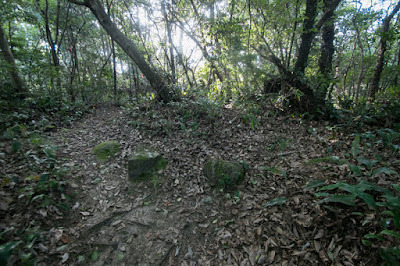 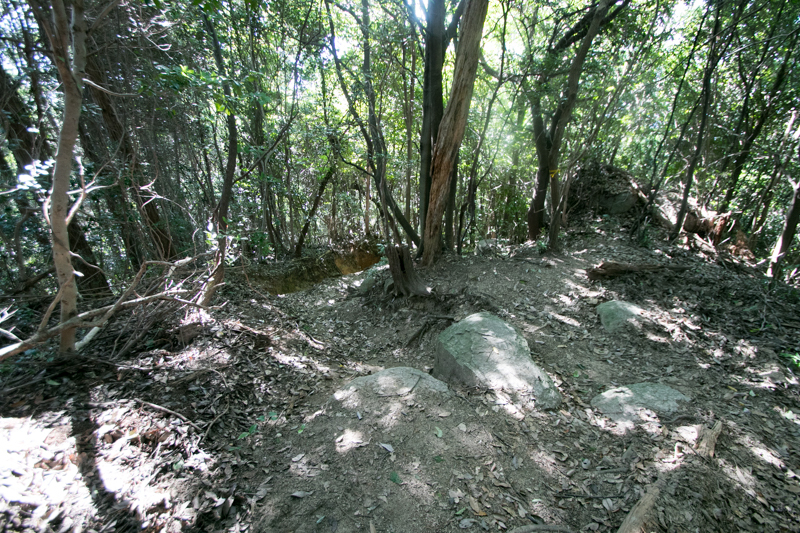 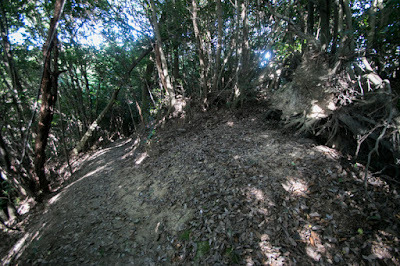 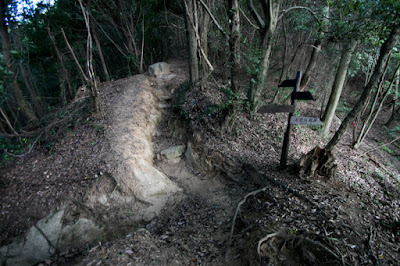 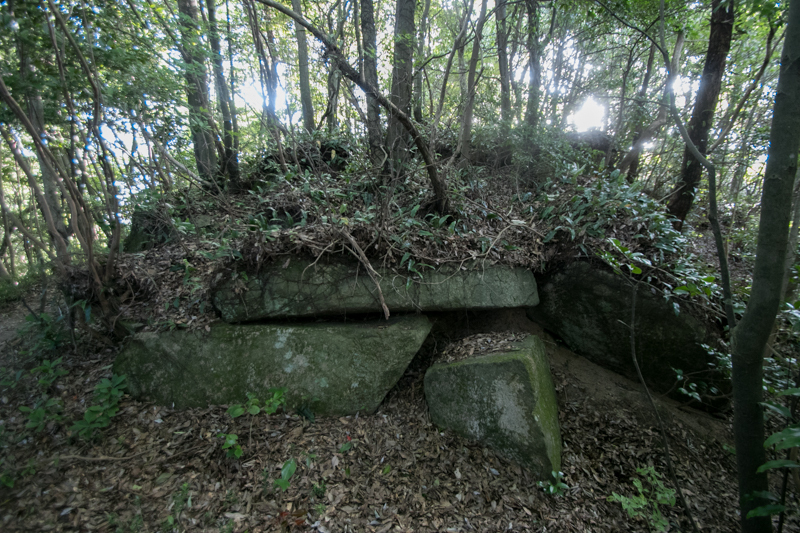 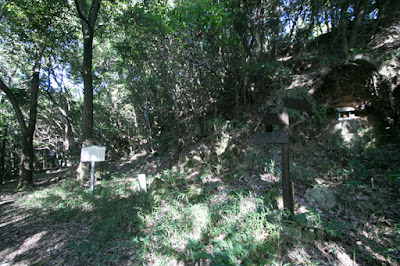 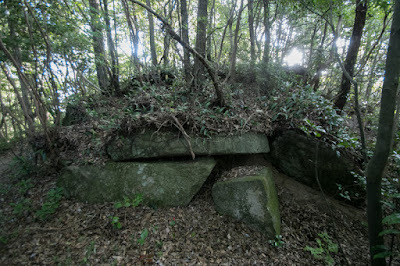 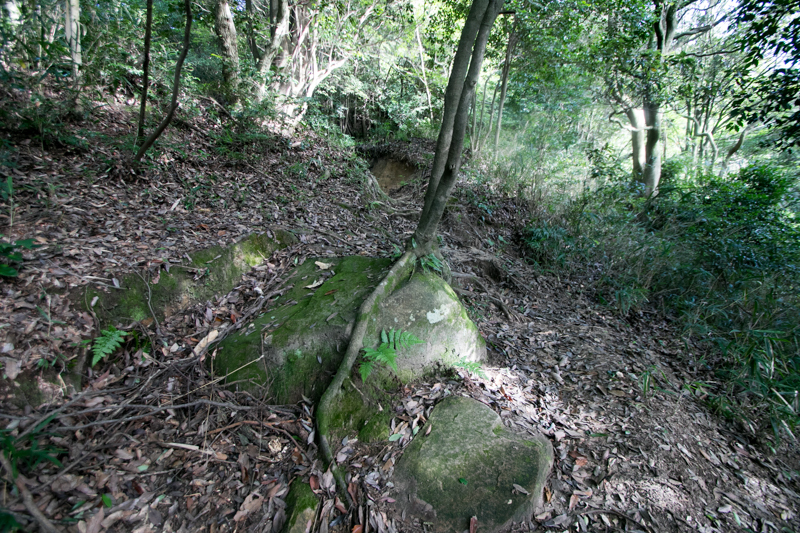 Currently castle site is at the north border of central Hiroshima area. 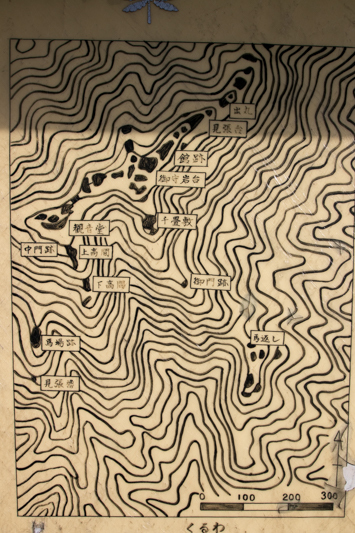 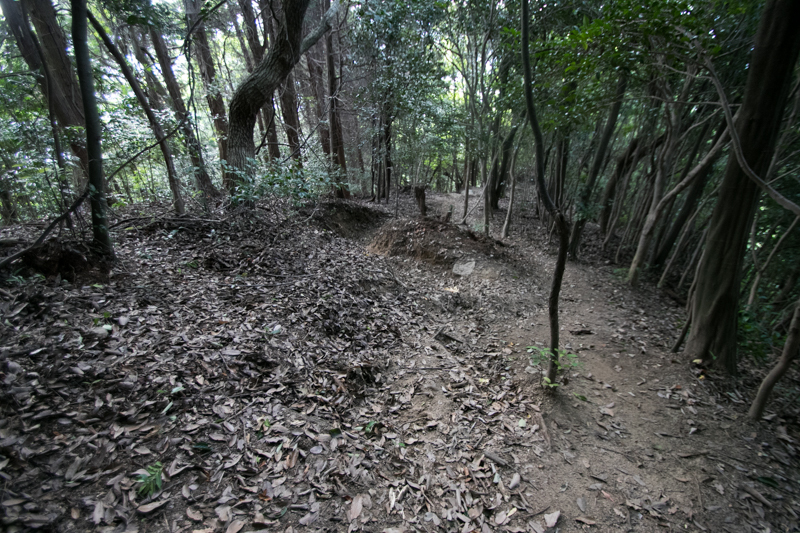 But in the medieval era, before large size land reclamation on and after Edo era, the coast line was around the south border of current Hiroshima castle. 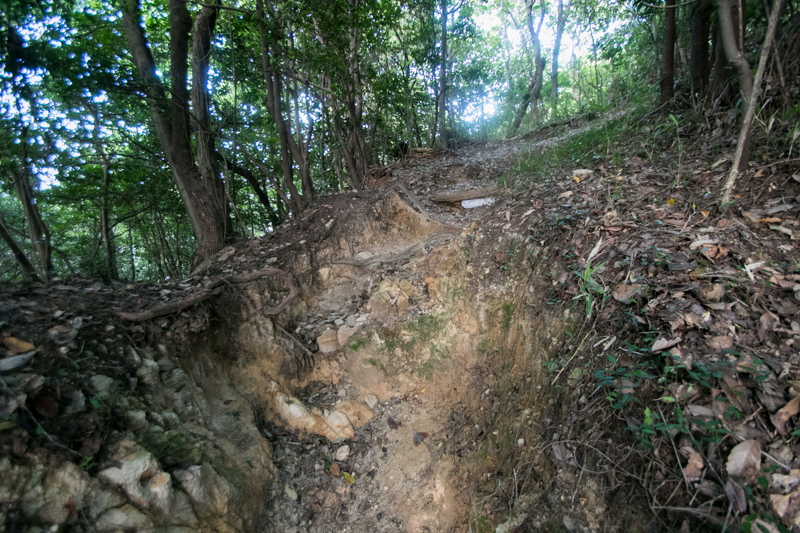 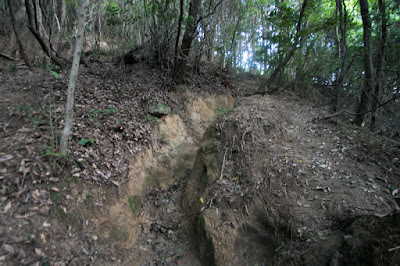 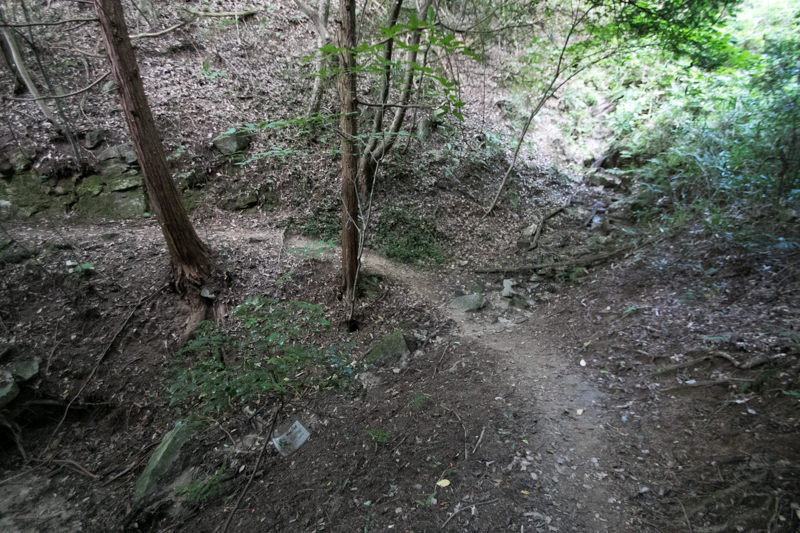 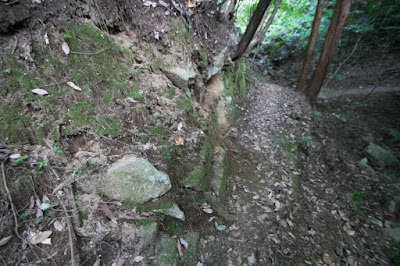 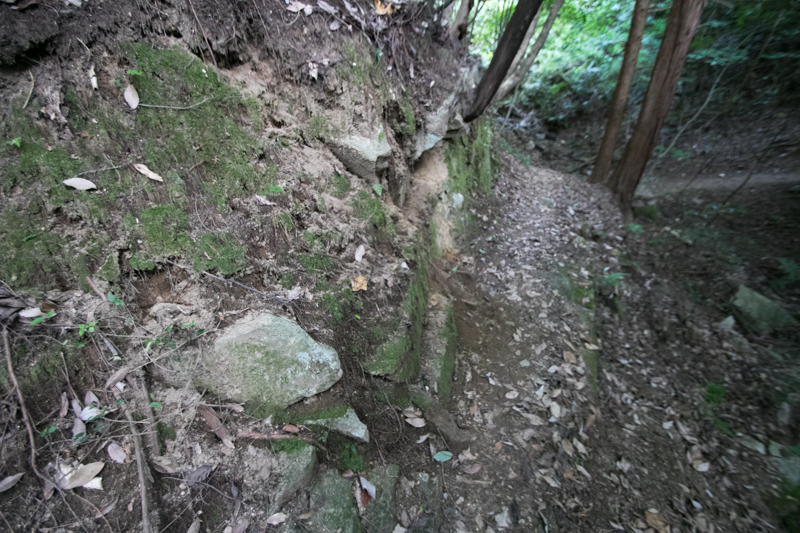 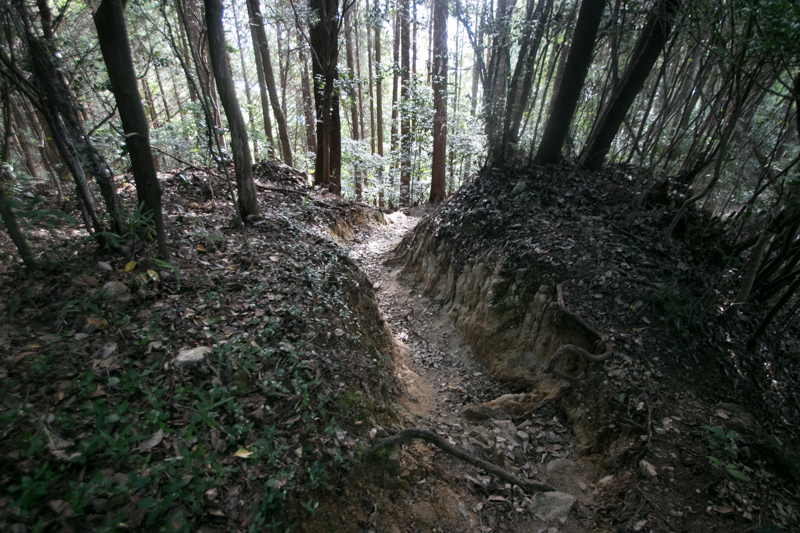 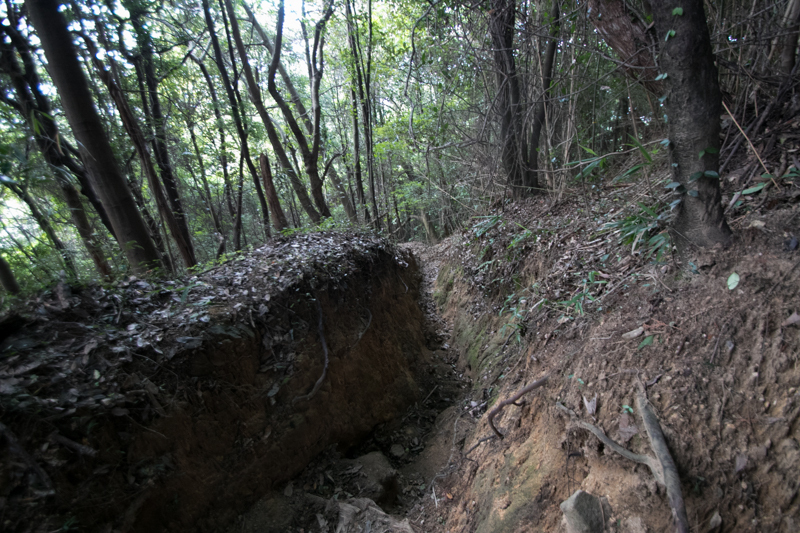 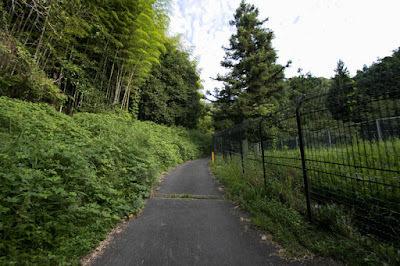 Beside, Sanyo-do road which was a main artery connected Kyoto city and Hakata city originally went upstream at the west side of mountains and ran the north of Takeda-yama mountain. 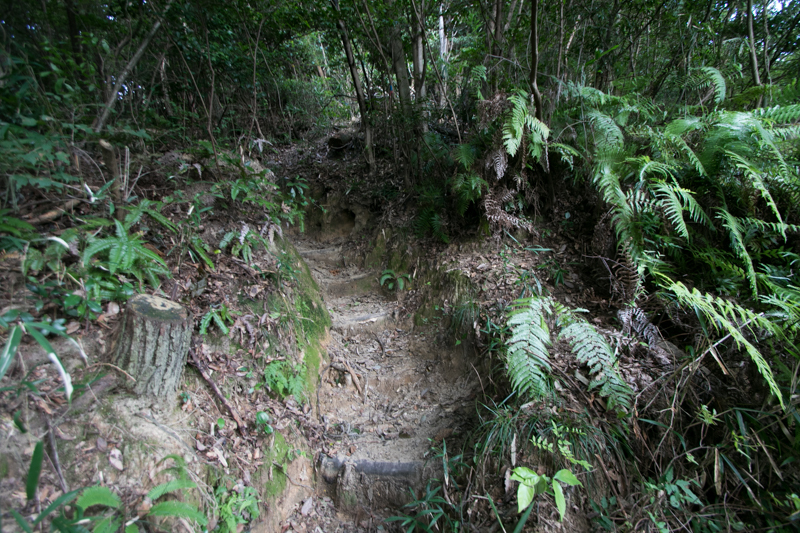 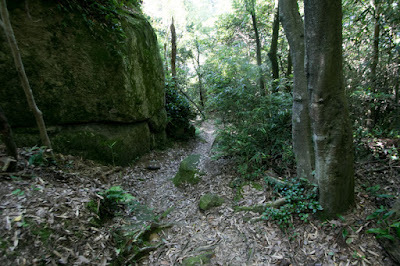 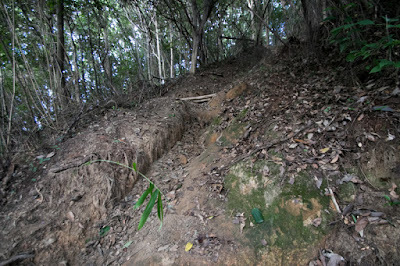 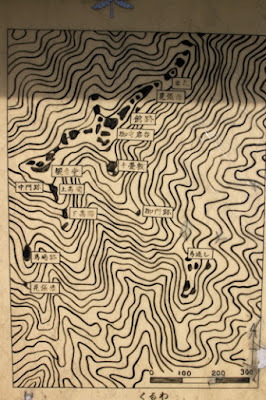 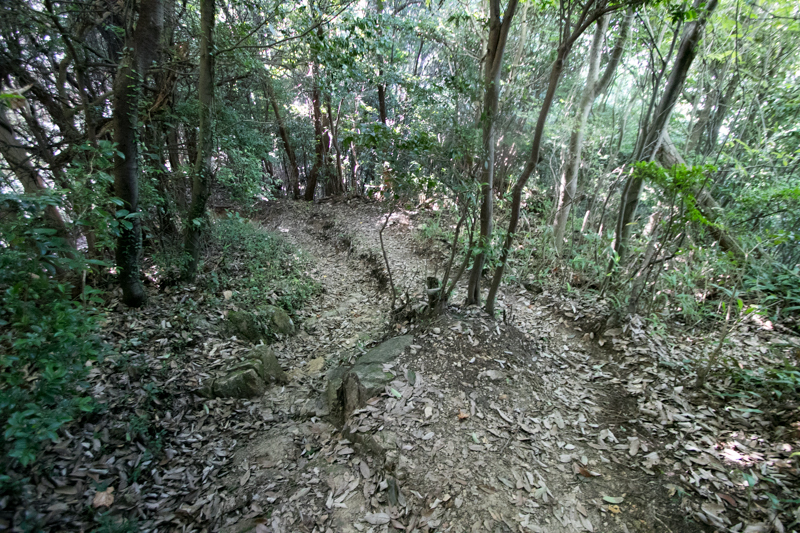 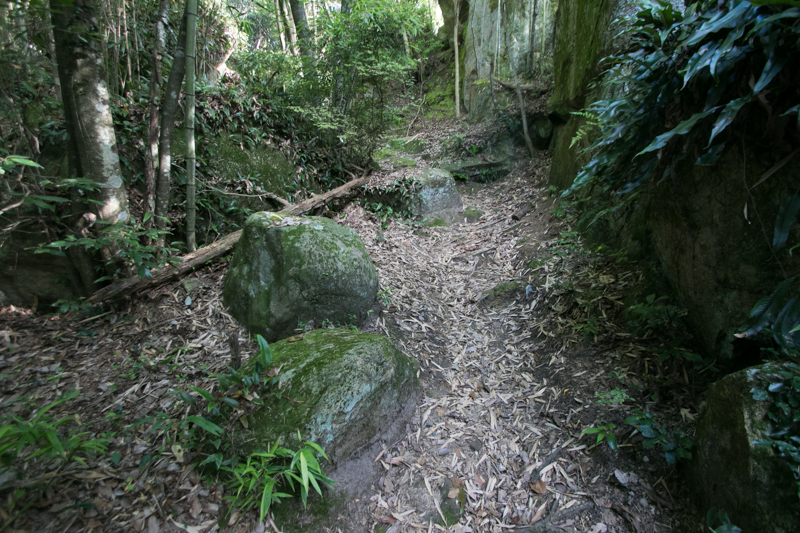 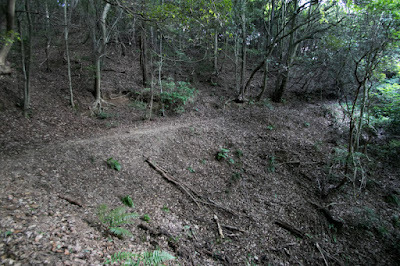 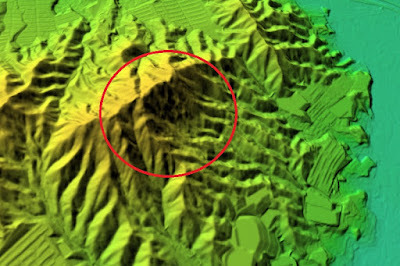 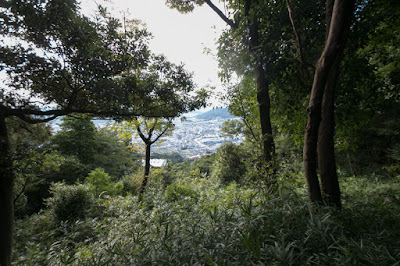 Because of this reason, the flat area of about 3 kilometer long and 1 kilometer wide at the east hillside of Takeda-yama mountain was the center of commerce which connected land transportation of Sanyo-do road, marine transportation toward Seto-Naikai sea and river transportation toward north via Ota-gawa river and had several markets. 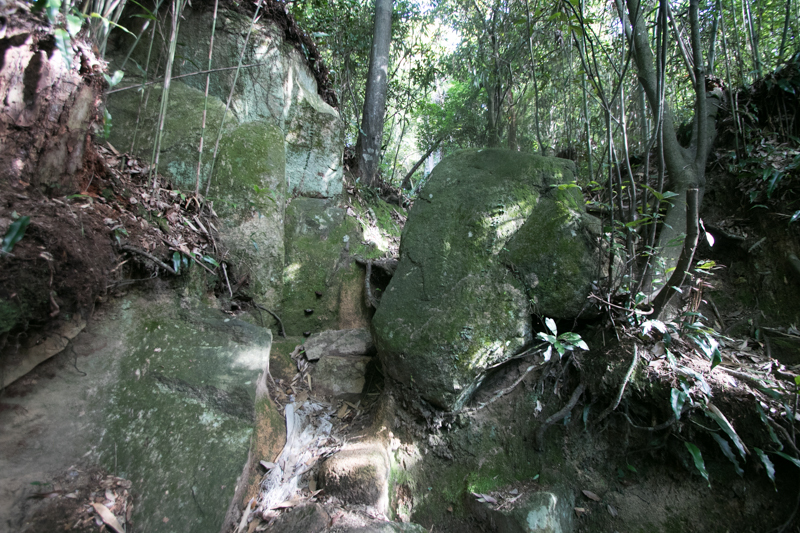 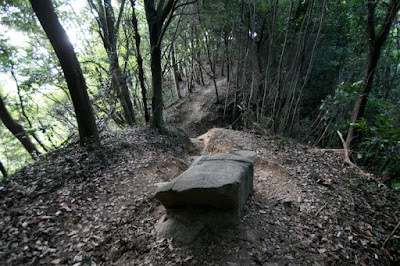 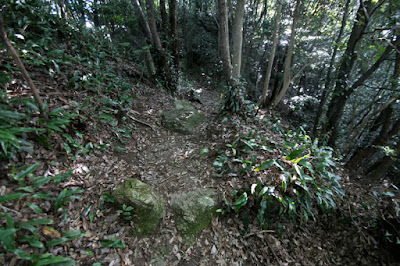 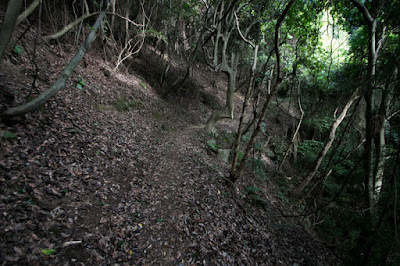 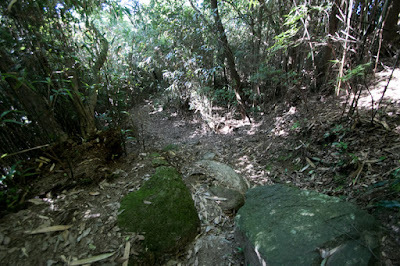 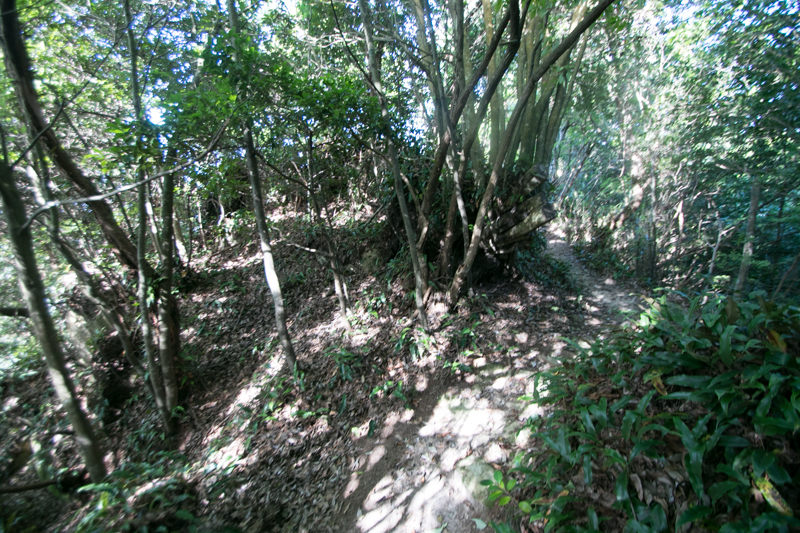 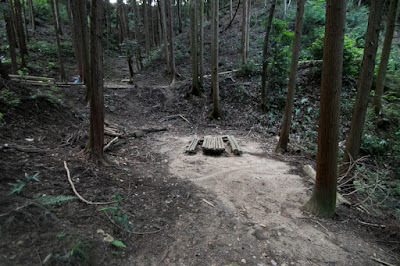 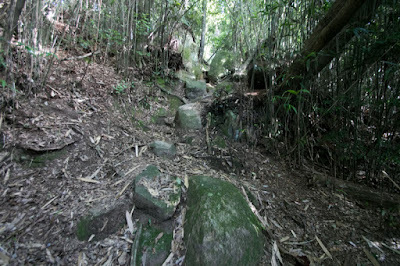 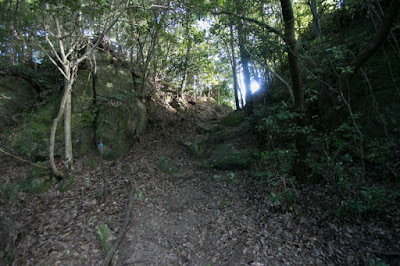 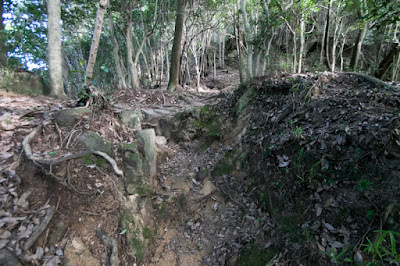 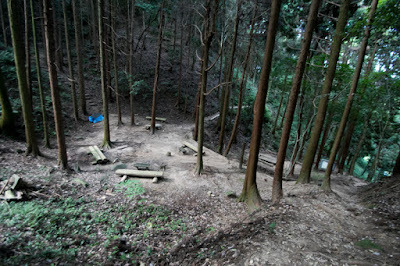 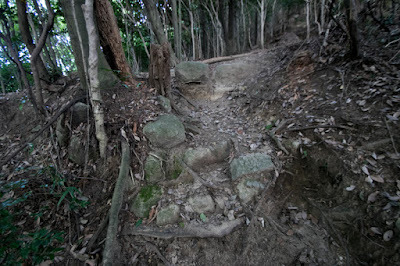 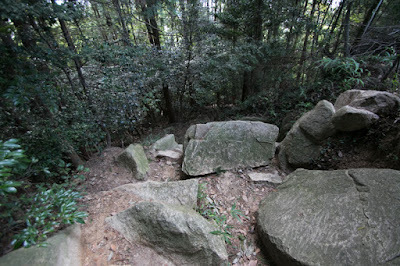 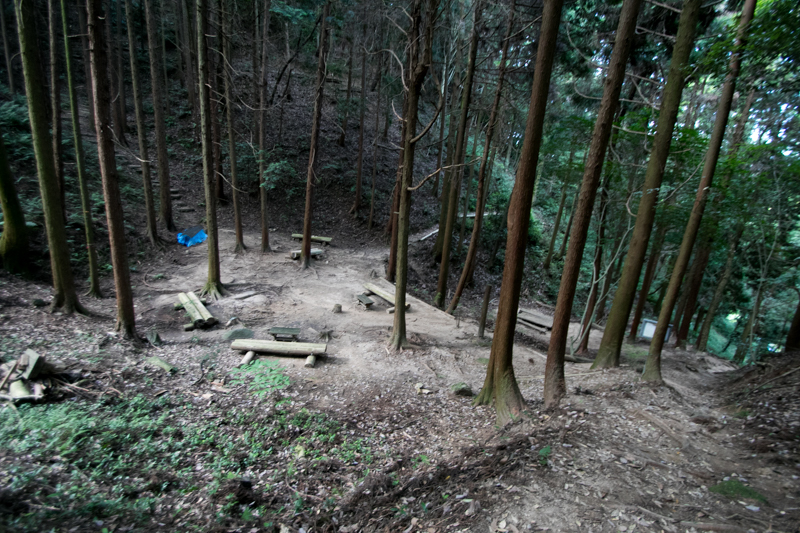 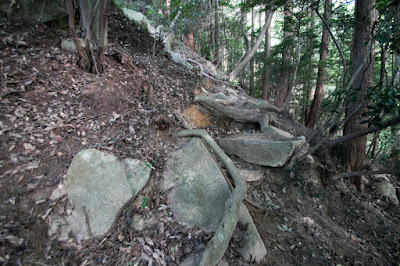 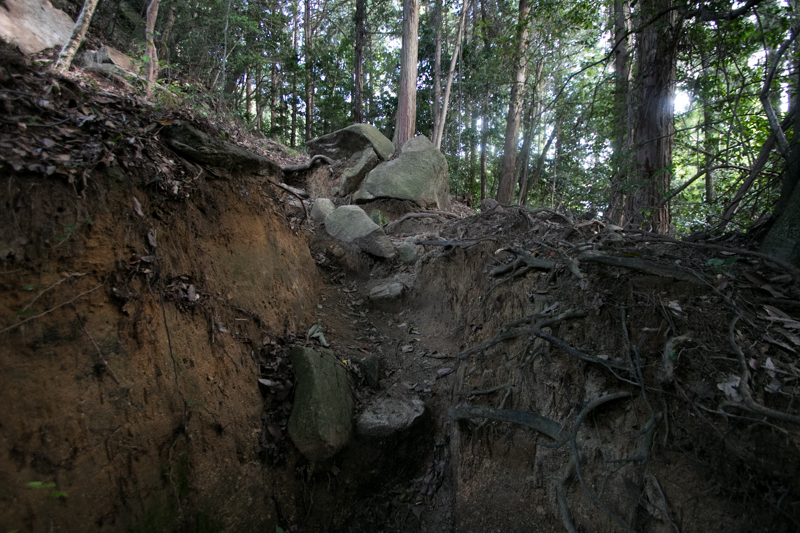 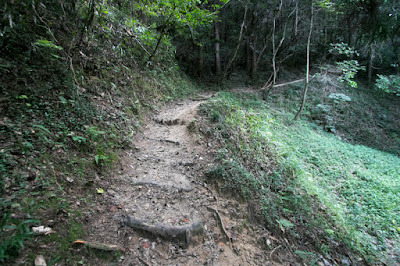 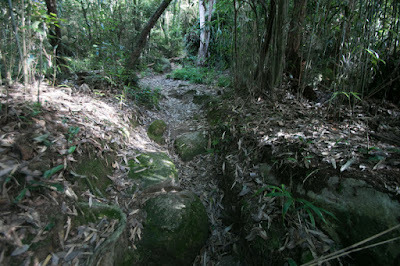 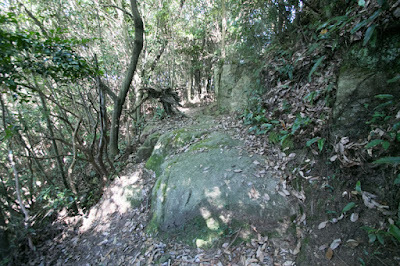 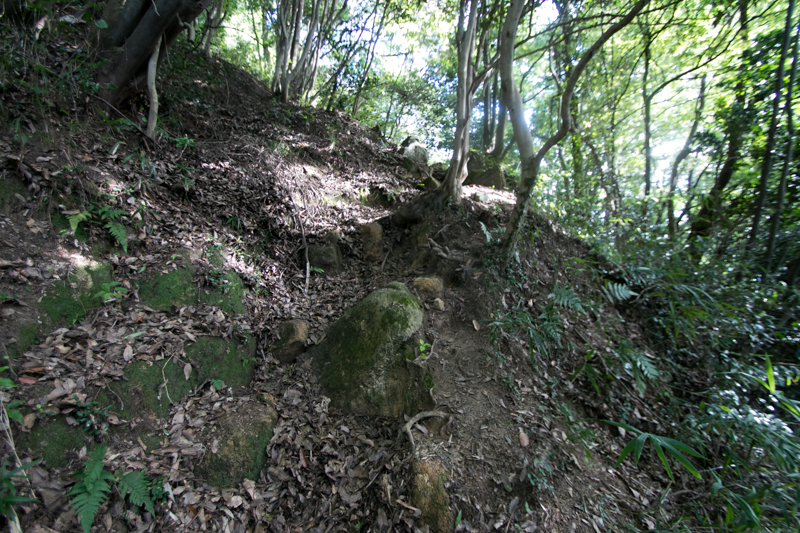 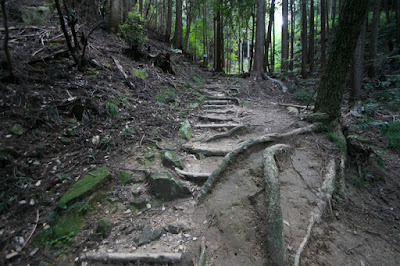 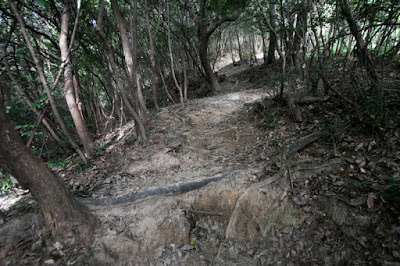 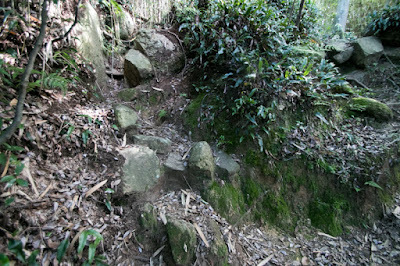 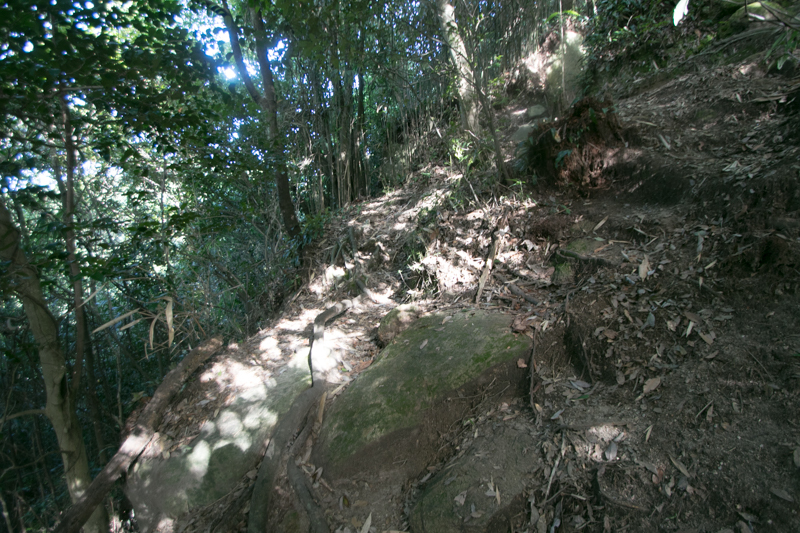 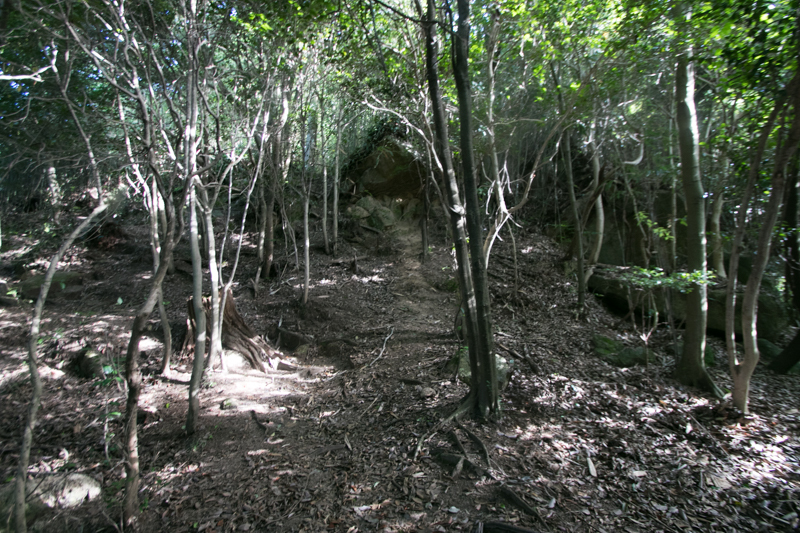 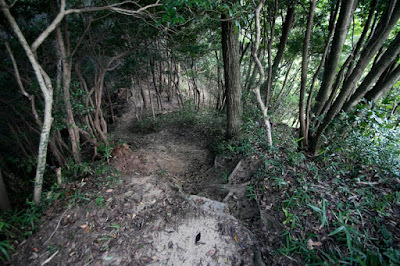 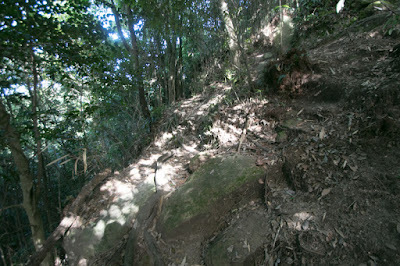 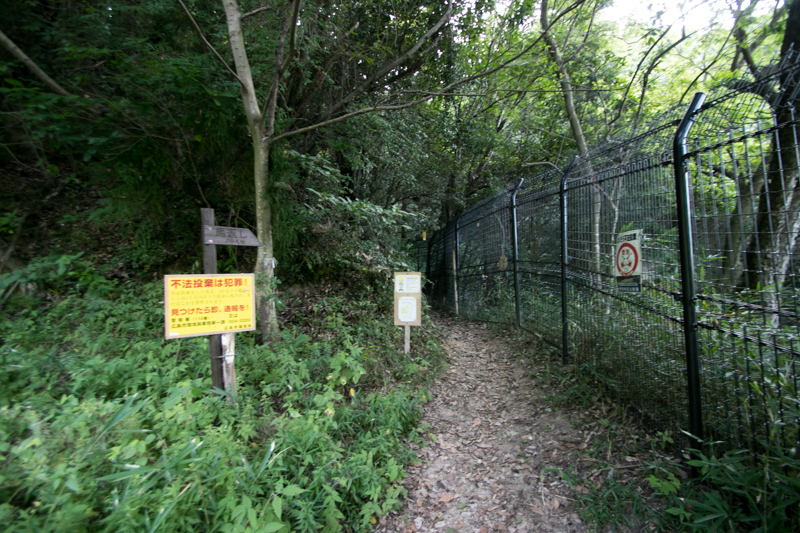 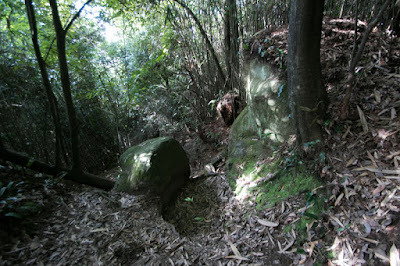 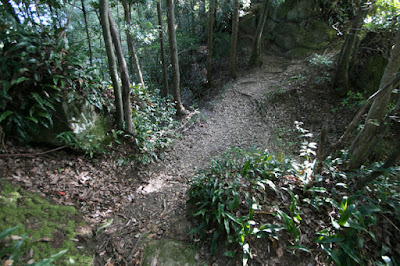 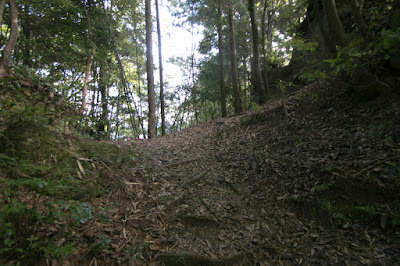 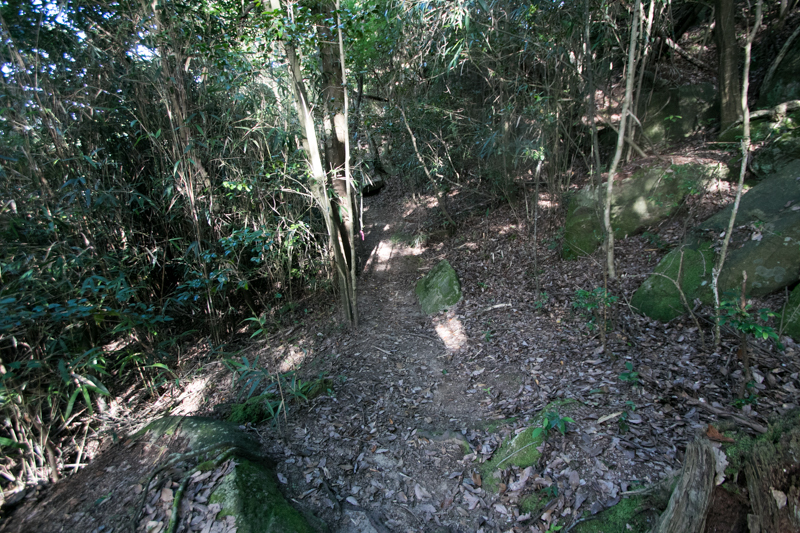 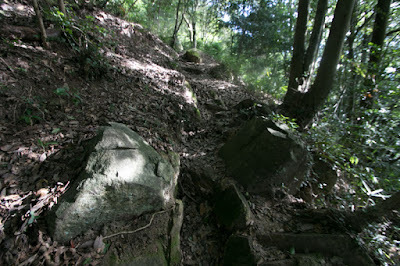 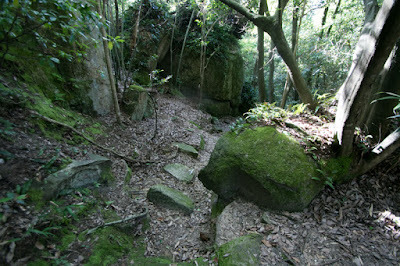 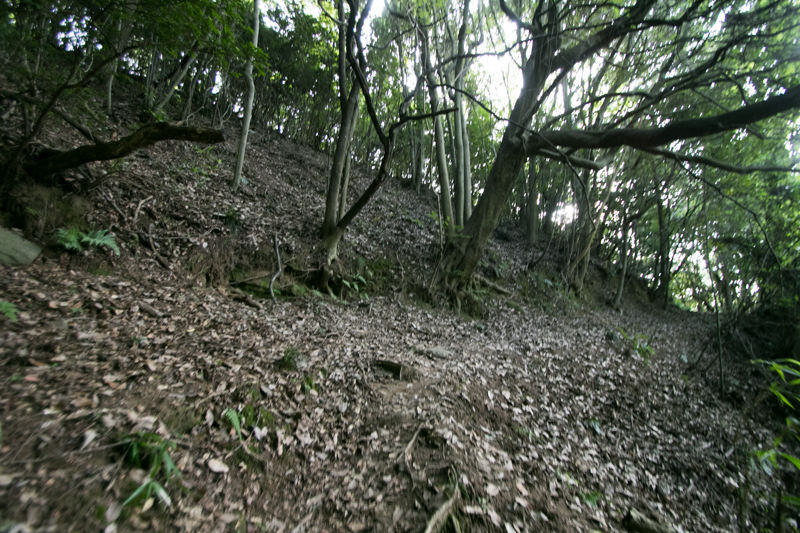 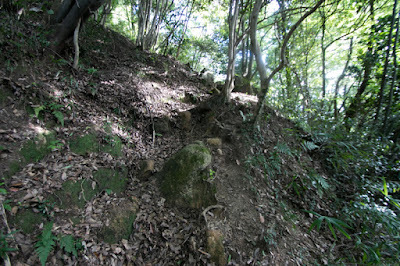 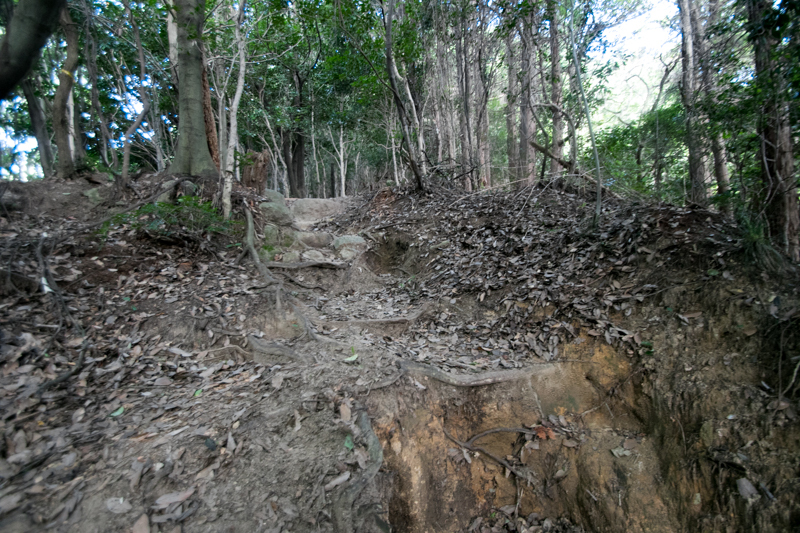 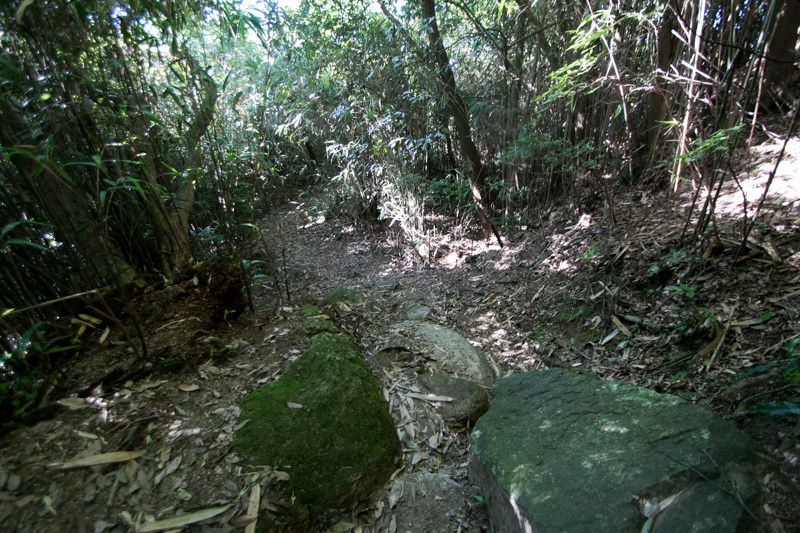 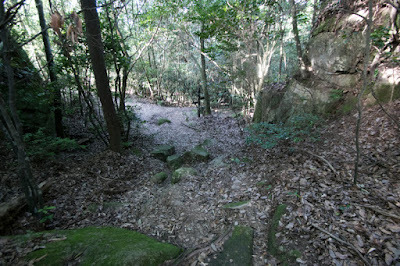 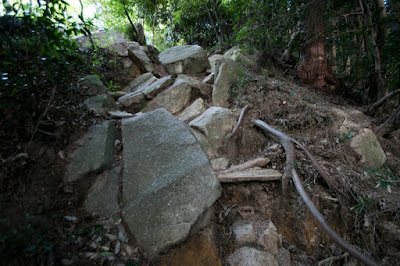 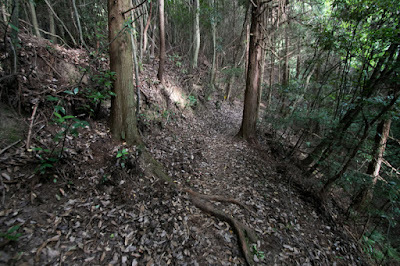 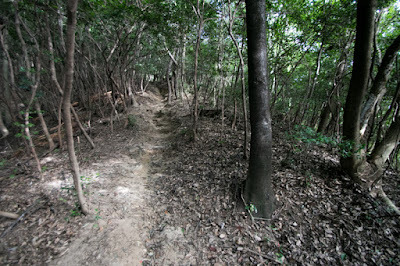 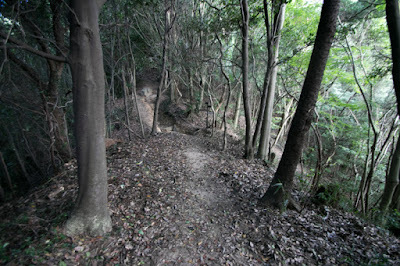 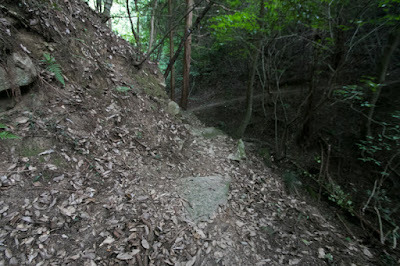 Takeda-yama mountain was a quite convenient place to control this important area. Precise year is unknown but Sato Kanayama castle might be around 1300 by local lord Aki Takeda clan. 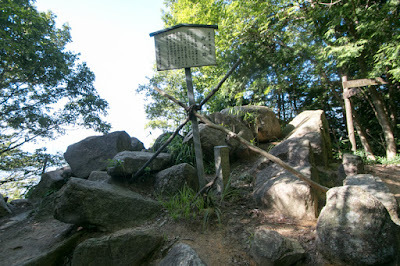 Aki Takeda clan is a branch family of Takeda clan which also diverged into Takeda clan of Kai province (Yamanashi prefecture), which is famous for its leader Shingen Takeda (1521-1573). 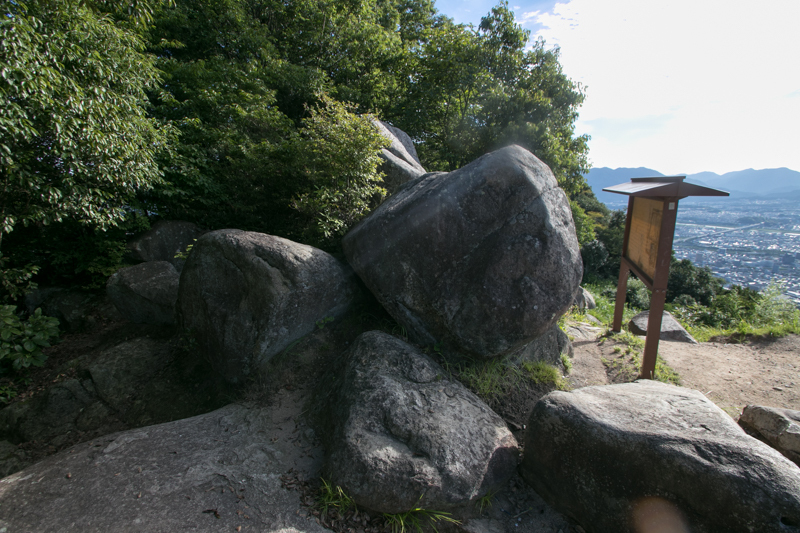 Takeda clan was a traditional clan stem from Yoshimitsu Minamoto (1045-1127), a powerful family of Minamoto clan. Descendant of Yoshimitsu moved to Kai province in 12th century and expanded their territory. Takeda clan activated at the establishment of Kamakura Shogunate, but also feared its power by Yoritomo Minamoto (1147-1199), the founder of Kamakura Shogunate. 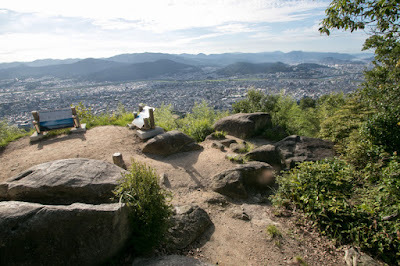 At the battle of Jokyu between Kamakura Shogunate and retired emperor occurred in 1221, Takada clan activated at Shogunate side and achieved Aki province (Hiroshima prefecture) as a reward. 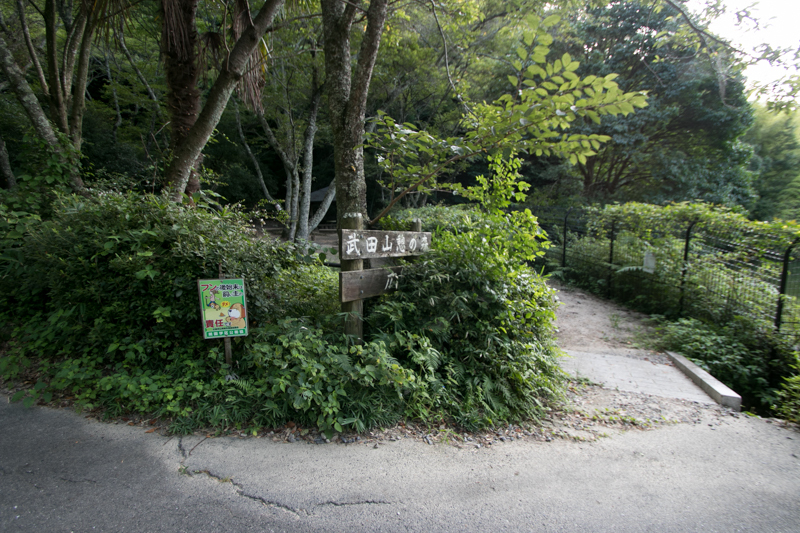 At first Takeda clan send their magistrate to Kai province, but in the latter half of 13th century Takeda clan once diverged into Kai province and Aki province. After the ruin of Kamakura Shogunate in 1333, at the conflict between Muromachi Shogunate and the North Court lead by Emperor Godaigo (1288-1339), Takeda clan at Kai province supported the North Court and lost the power with the Court. On the other hand, Nobutake Takeda (1292?-1359?) 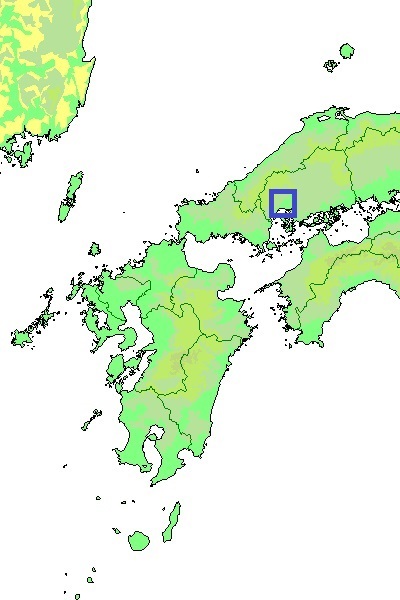 clan at Aki province supported Muromachi Shogunate, then expelled Takeda family at Kai province and became the governor of both Aki province and Kai province. 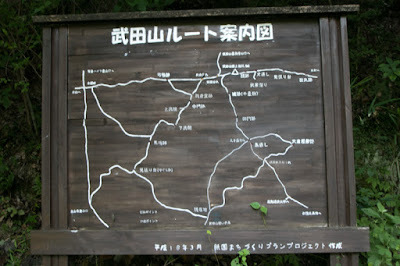 Later Takeda clan again diverged into the family of Kai province and Aki province. At Kai province being suffered from the pressure from Muromachi Shogunate or uplift of deputy governor Atobe clan, Takeda clan established its authority at the beginning of 16th century and became a strong warlord. 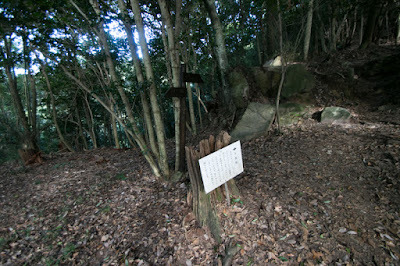 On the other hand, Takeda clan at Aki province could not make well. 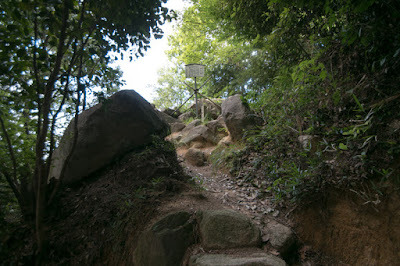 Once they were appointed as the governor of Aki province, this position was deprived and given to Ouchi clan, the strong lord which held Suo province and Nagato province (Yamaguchi prefecture). Later as a restraint toward Ouchi clan, Muromachi Shogunate appointed Takeda clan as the governor of west half of the province but this position was an incomplete one. 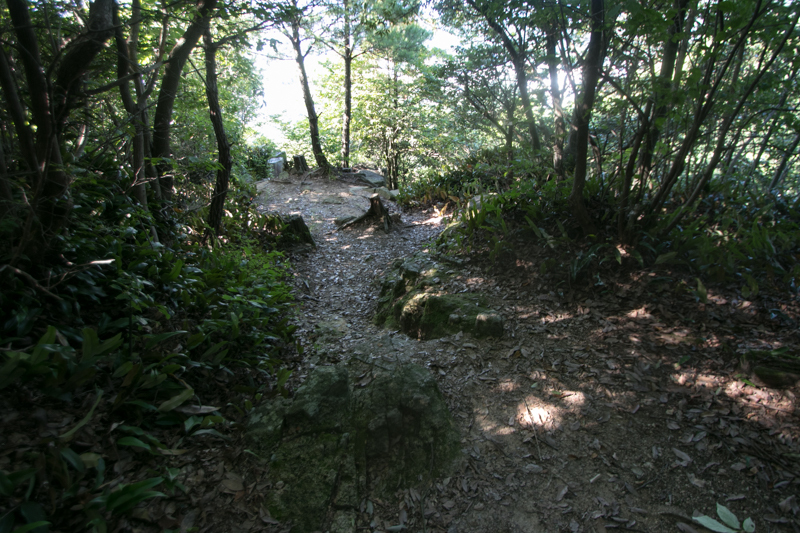 In 1440, as a reward for military operation of Muromachi Shogunate, Aki Takeda clan achieved the governor of Wakasa province (western half of Fukui prefecture). As Wakasa province was close to Kyoto city, Takeda clan thought importance of this province. 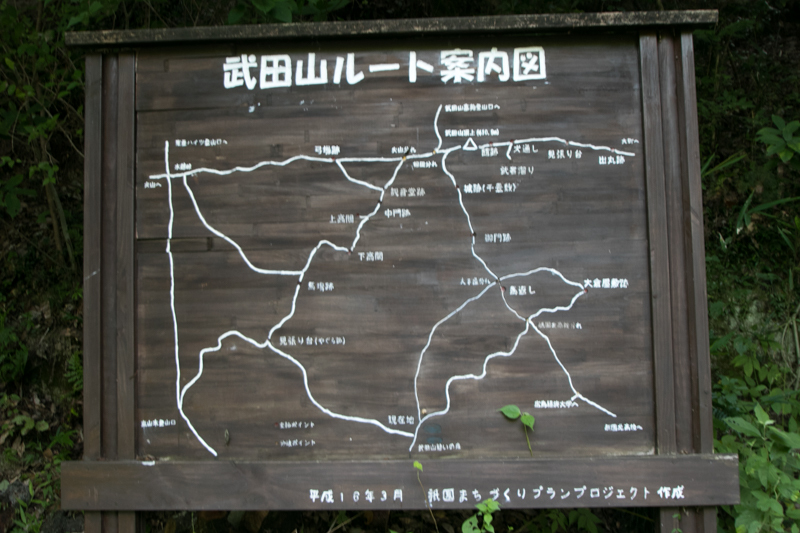 But Wakasa province was a small province and too distant from Aki province, it was impossible to help each other. 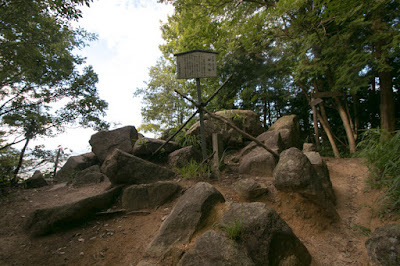 Around 1500, Aki Takeda clan once followed to Ouchi clan and accomplished with their march to Kyoto city. 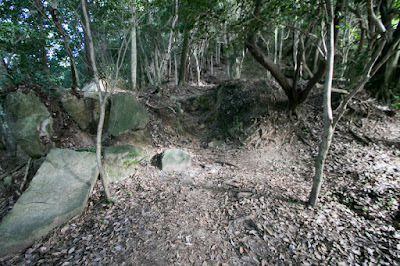 But dissatisfied with the burden of long expedition, in 1515, Aki Takeda clan which was ordered to return to Aki province to subjugate rebellion left Ouchi clan. Takeda clan tried to be an independent warlord at Aki province, and expanded Sato Kanayama castle as their main base. 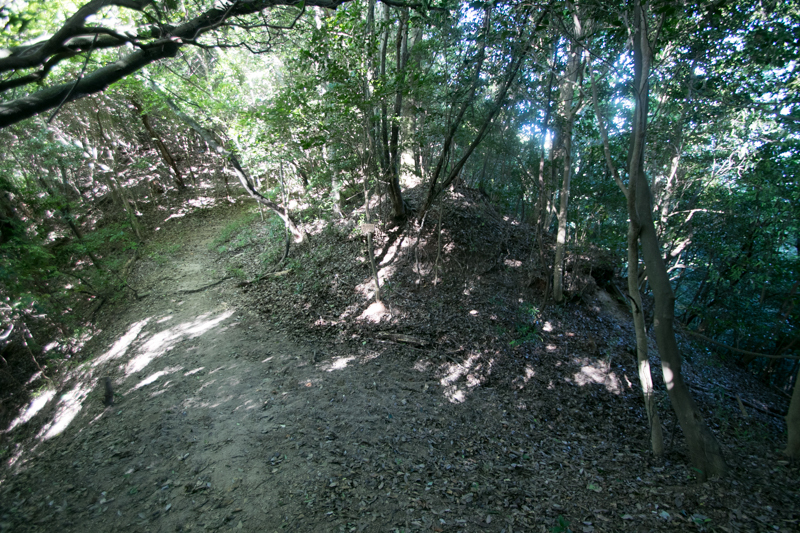 The shape of Sato Kanayama castle is roughly T letter which consist of the ridge spreads toward north, south and east from the peak. 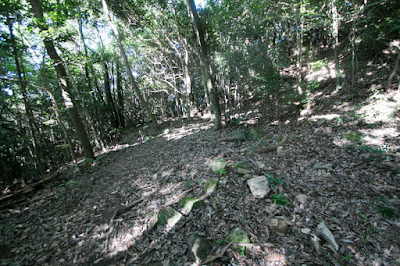 Central area of the castle is a round shaped area with many rocks, which might be used as a base of watching tower. 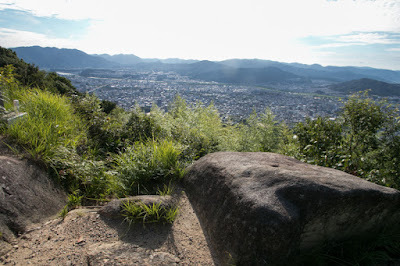 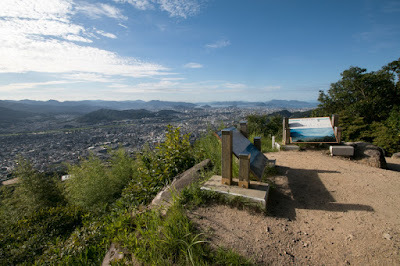 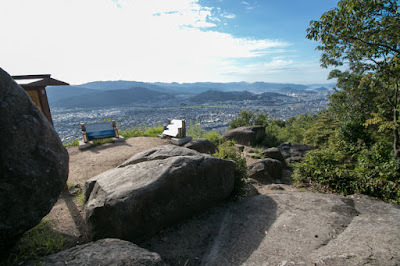 From this place a great scenery of Hiroshima city area and Seto-Naikai sea is enjoyable. 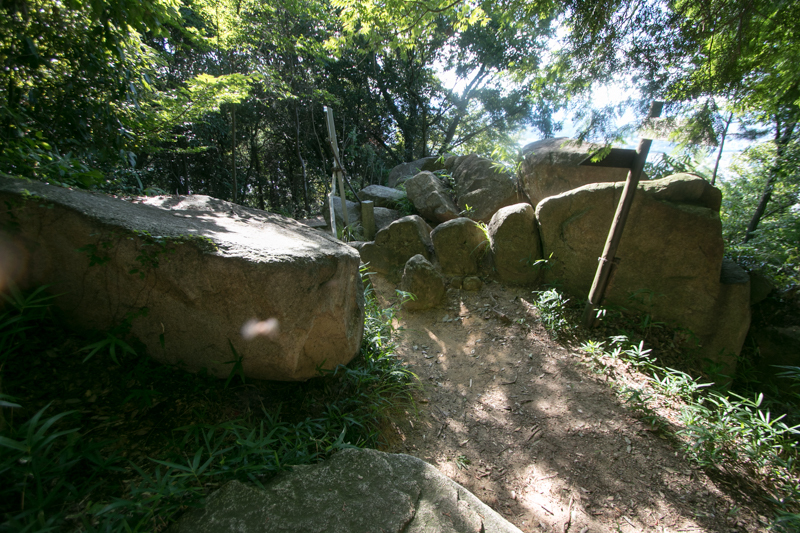 At the north of central area there is a large flat space of 50 meter long and 15 meter wide, which might be used as a ground of residence. At the north of this area, ahead of dry moat, there is a small compartment with large rock which might be used as a basement of watchtower. 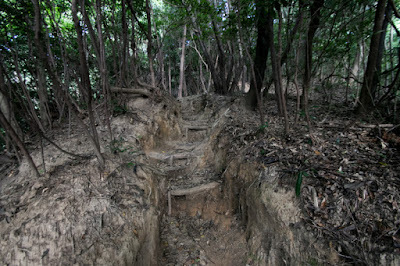 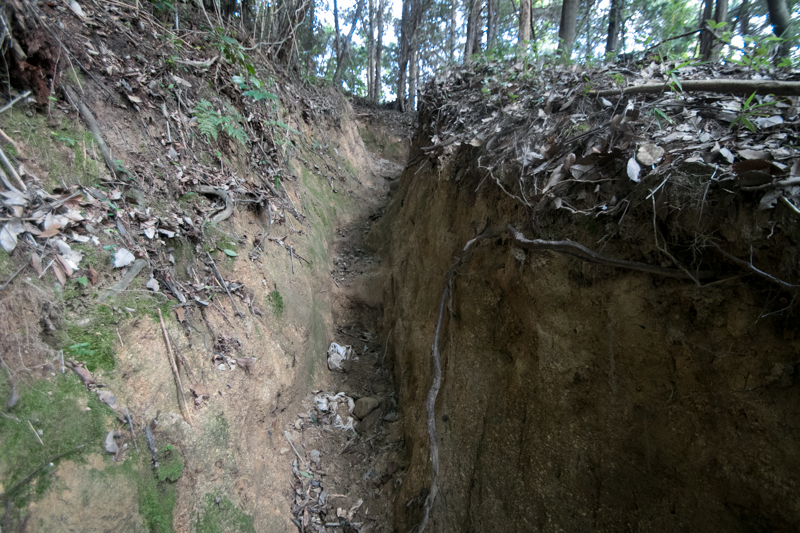 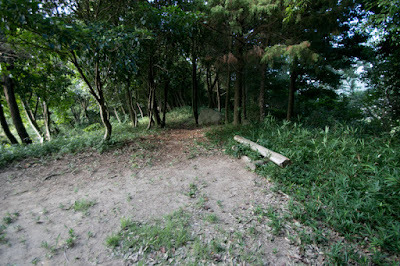 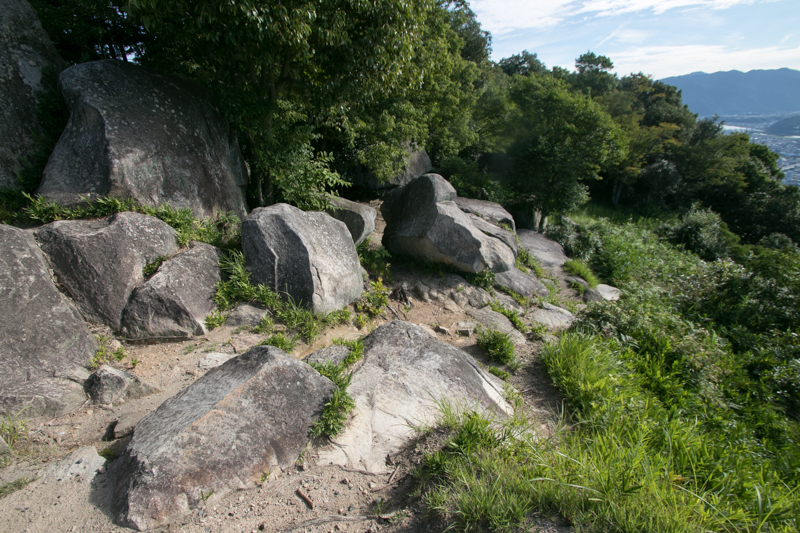 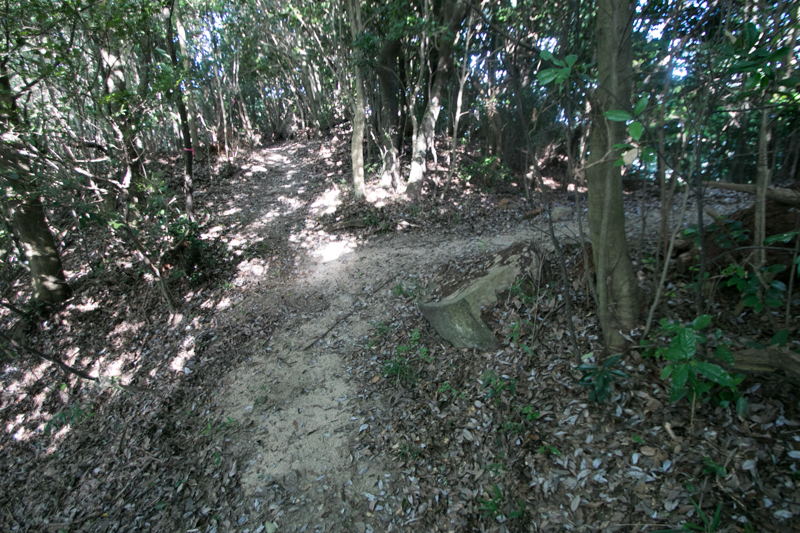 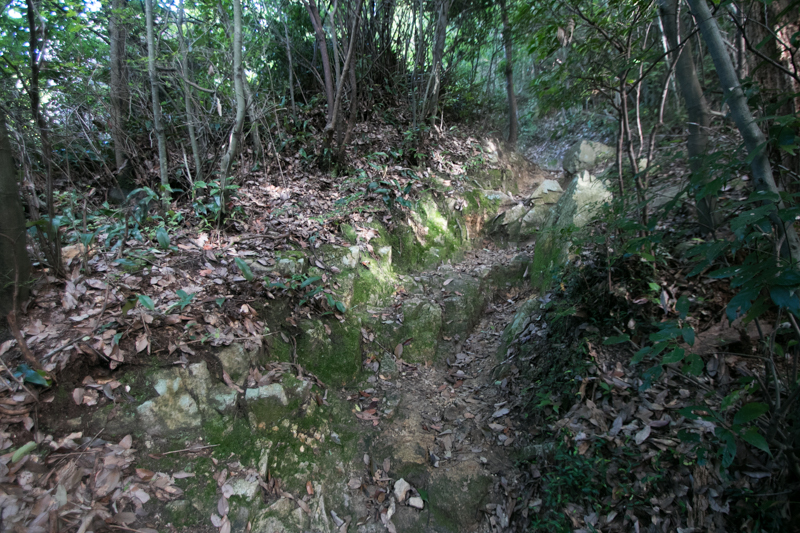 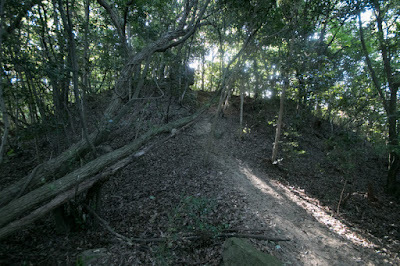 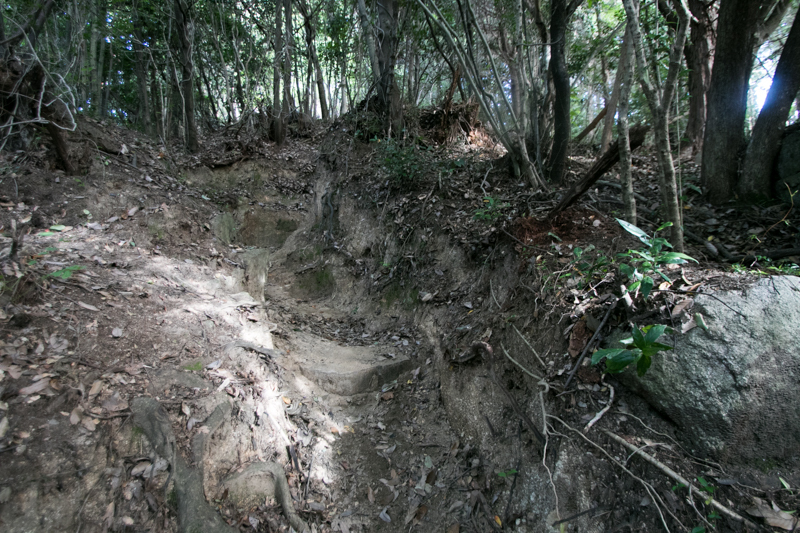 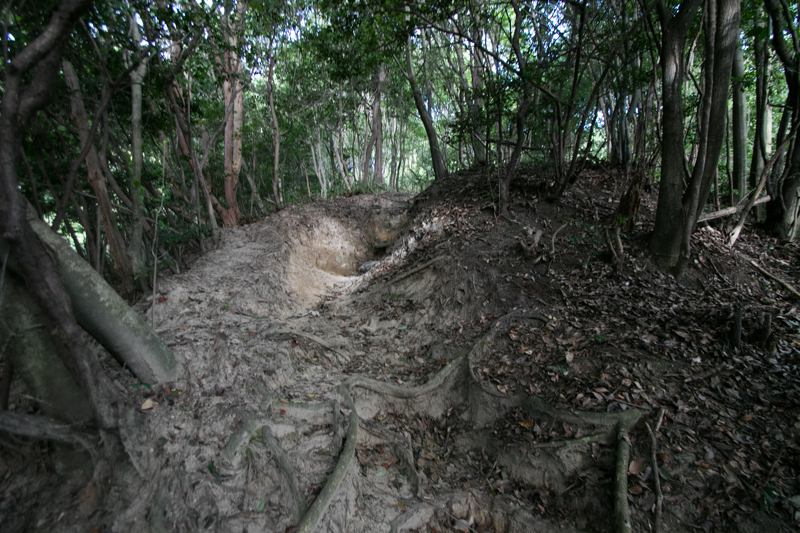 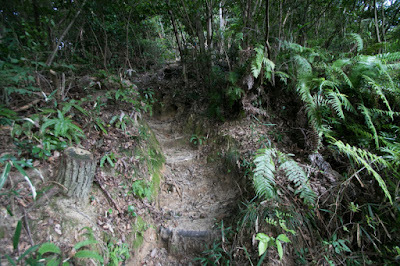 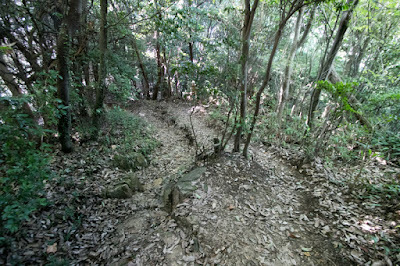 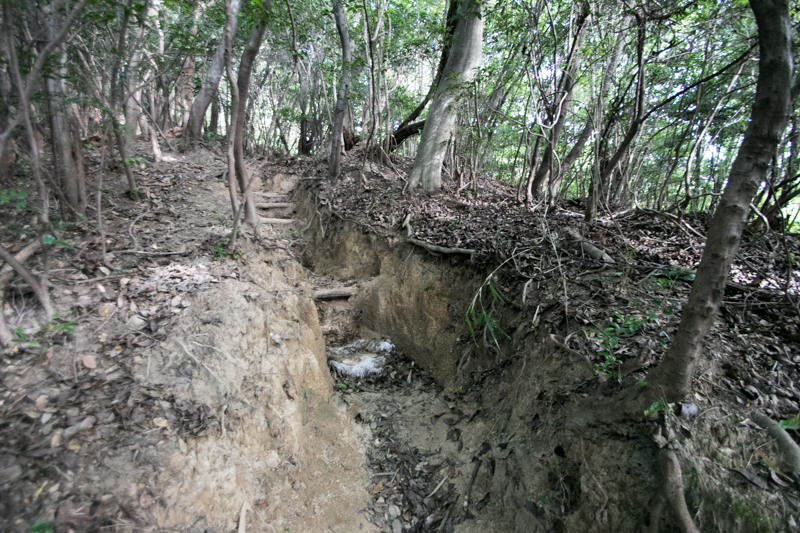 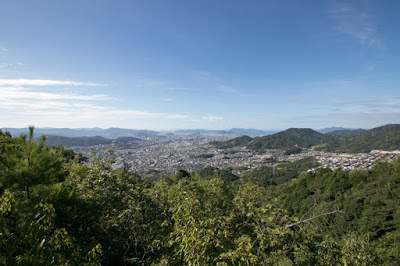 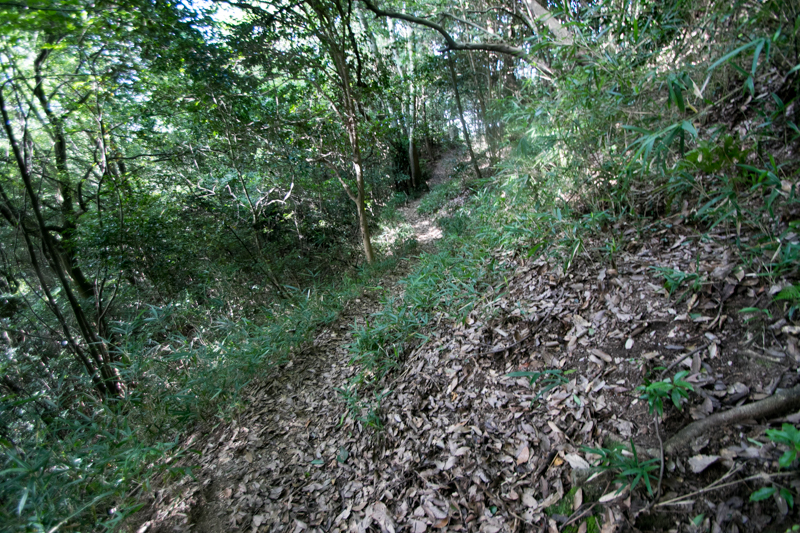 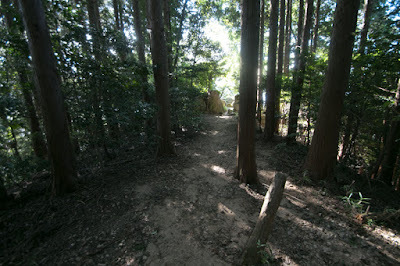 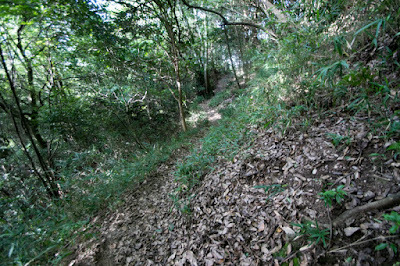 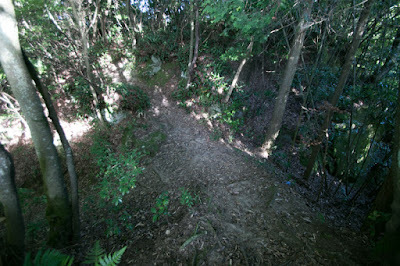 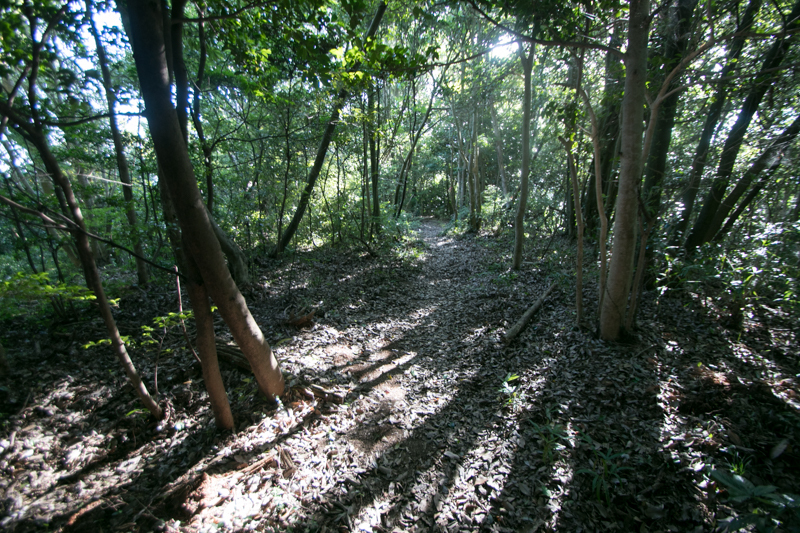 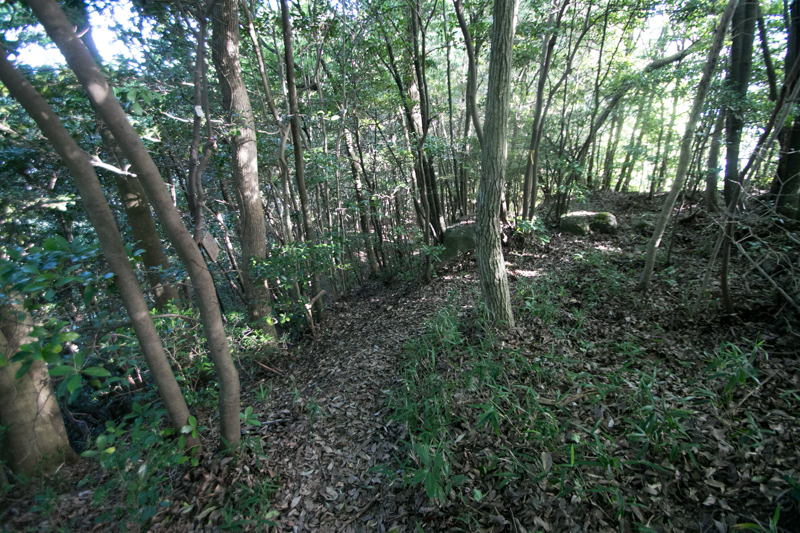 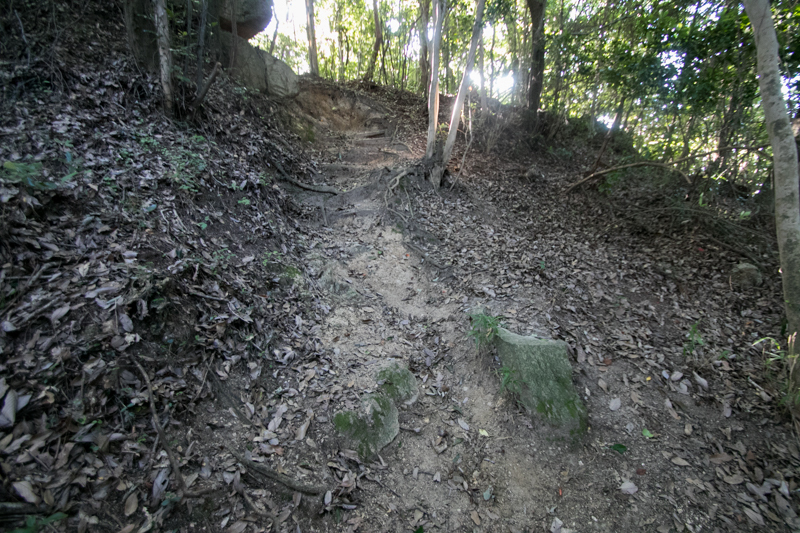 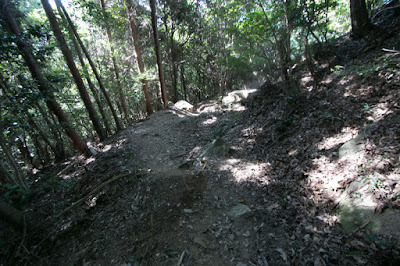 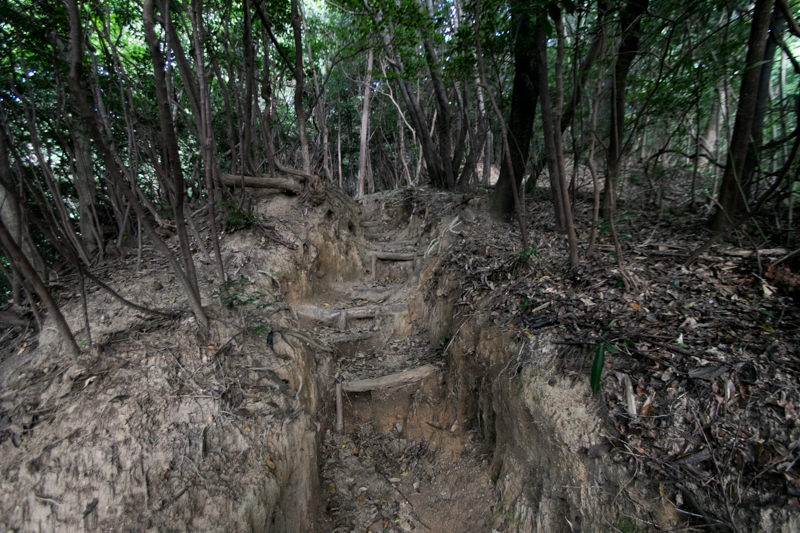 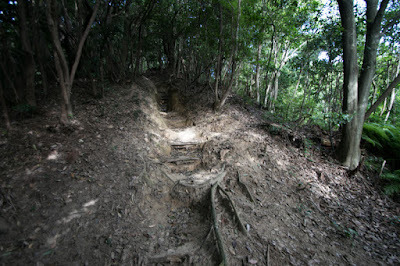 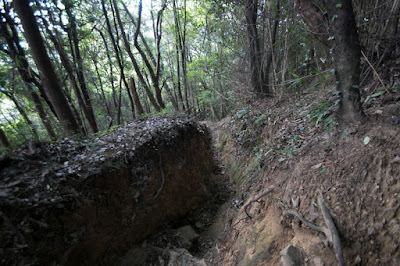 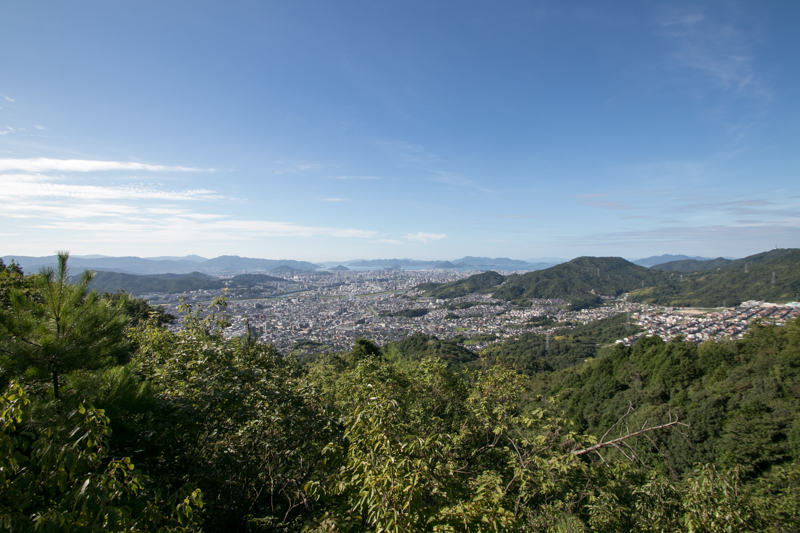 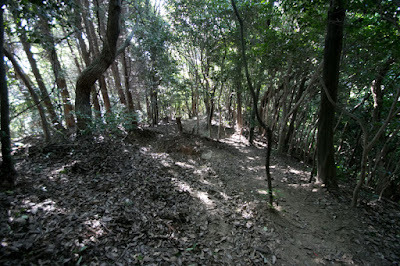 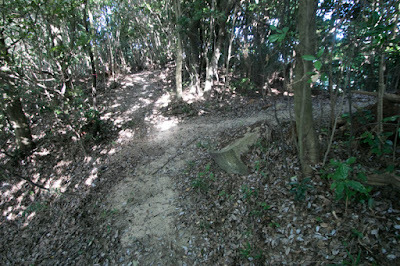 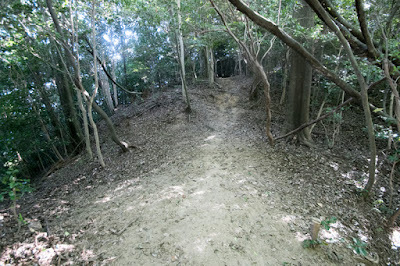 On the other hand, at the southward, there are several terraces such as Kannondo or Kamitakama. These terraces are well shaped and has slight ruin of stone walls, and might be built in the last period. 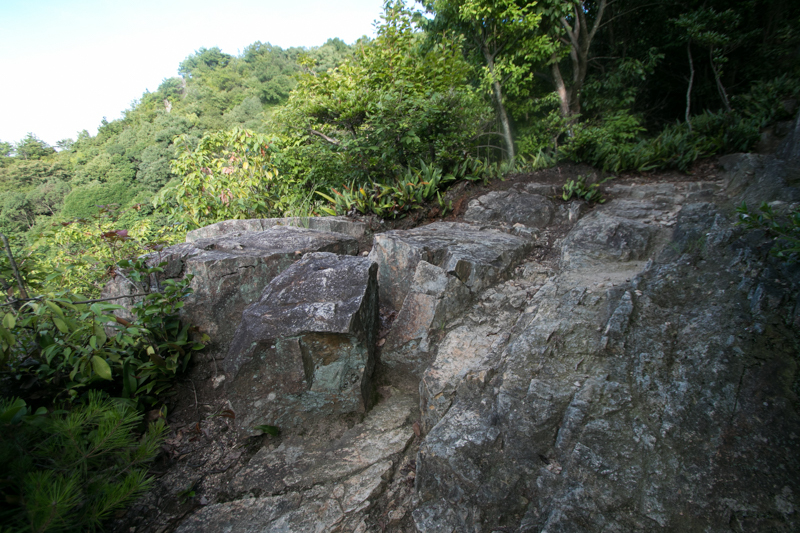 East side ridge is a main route from hillside. 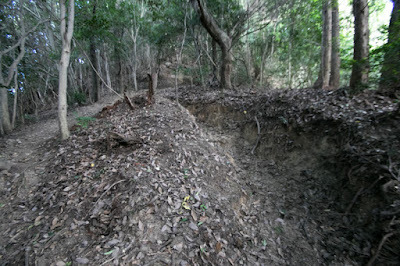 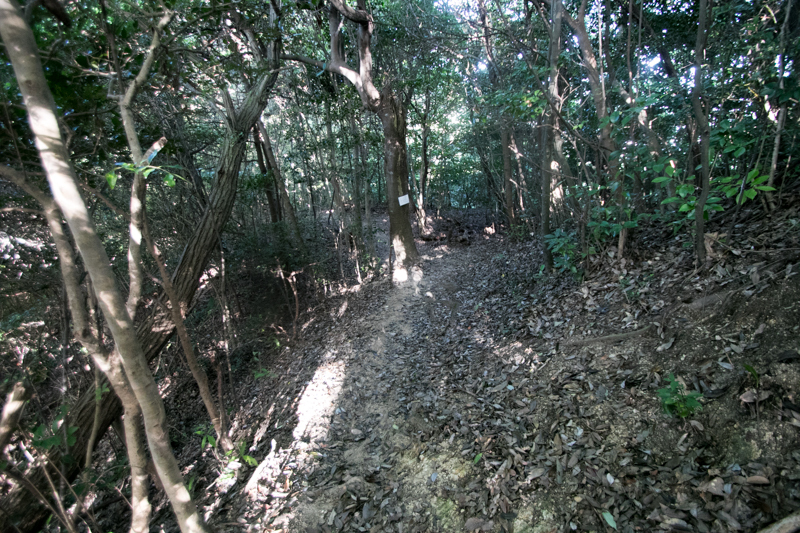 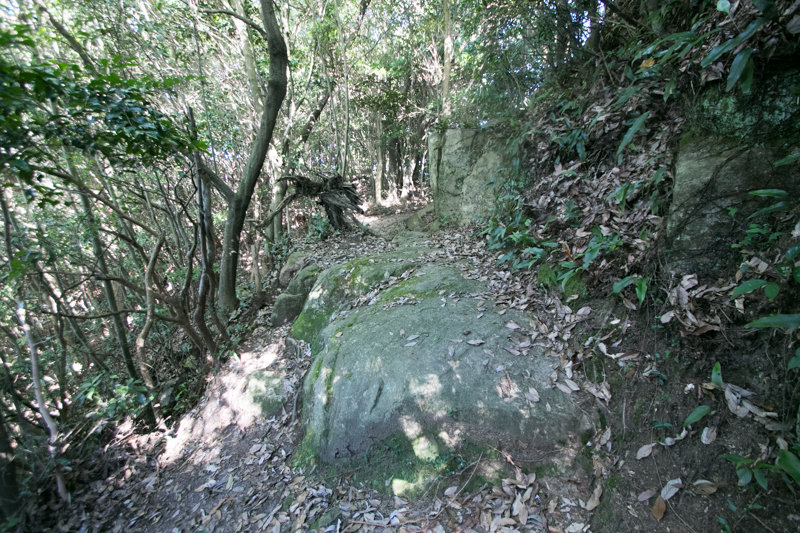 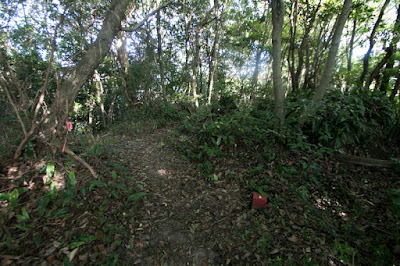 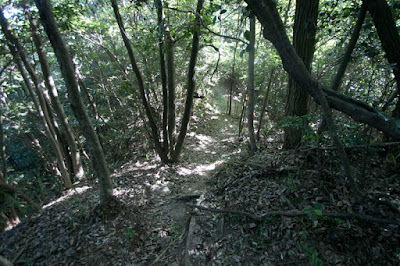 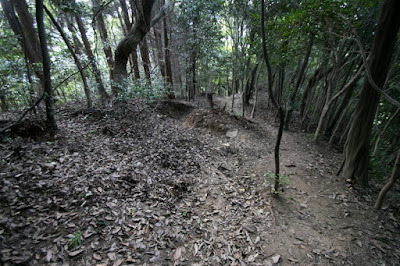 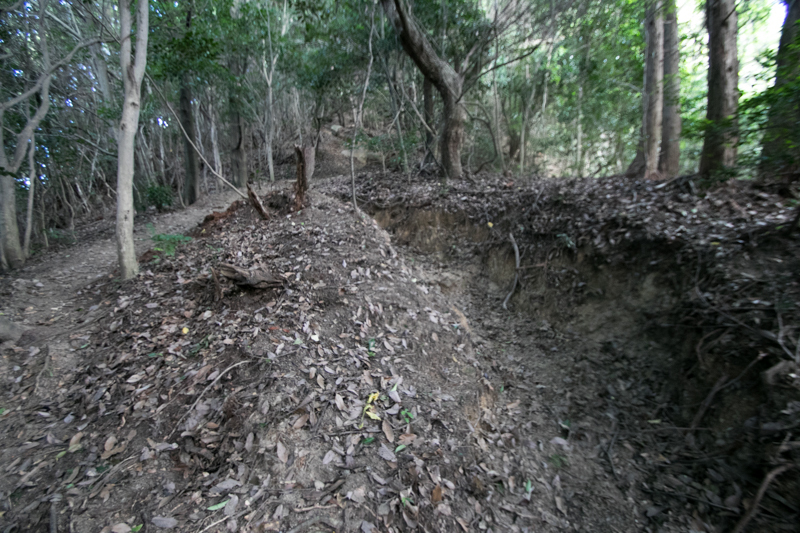 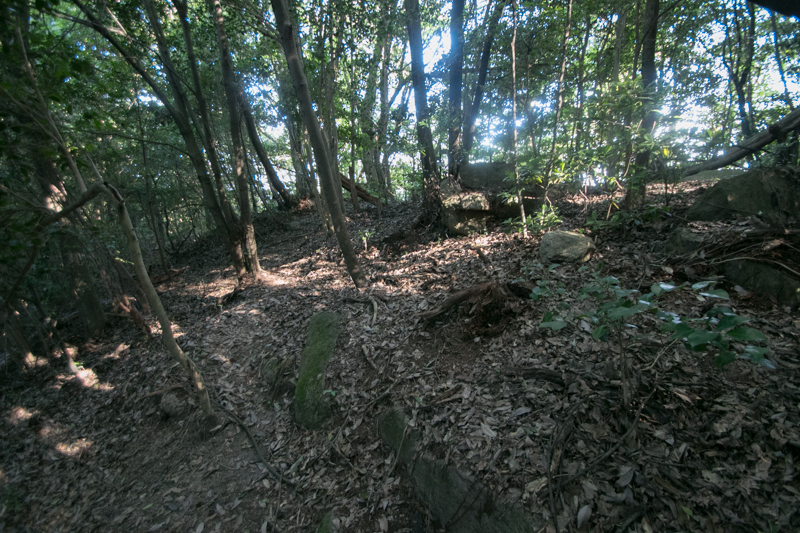 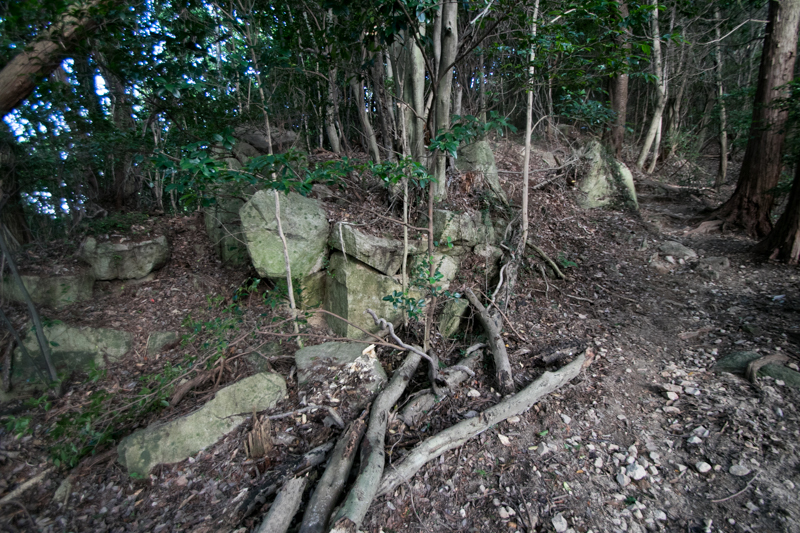 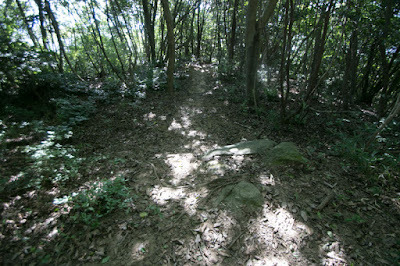 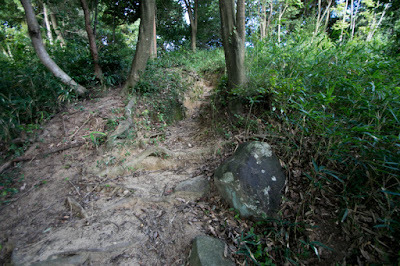 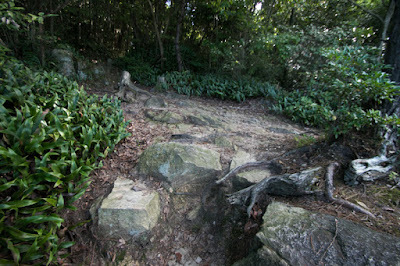 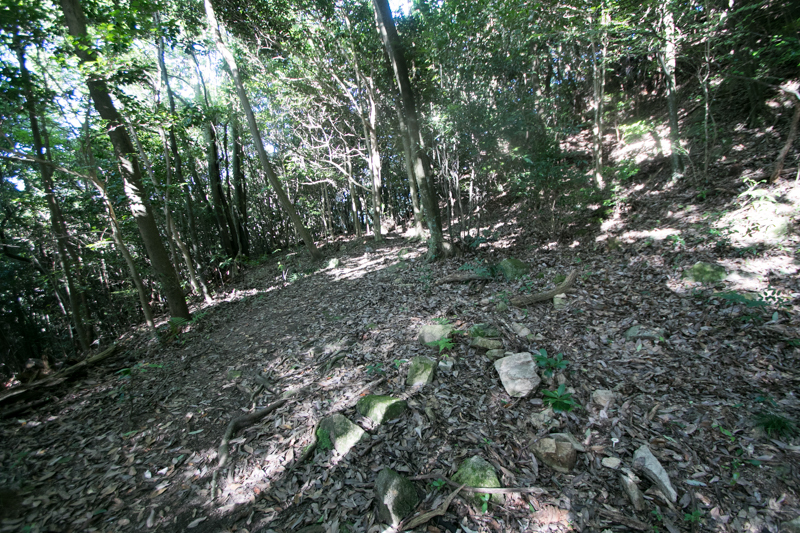 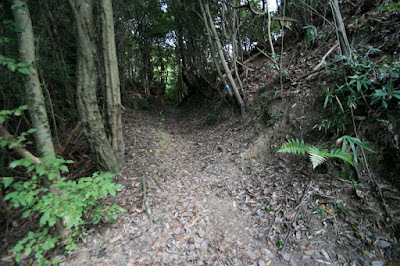 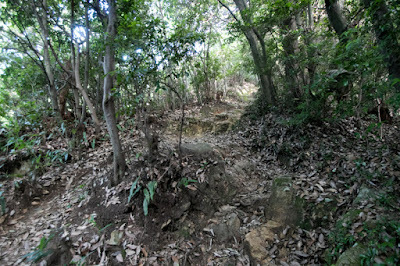 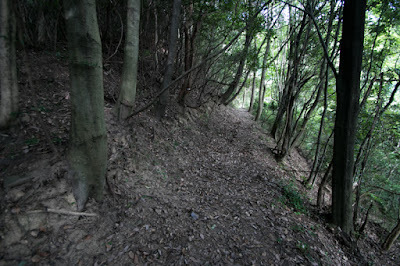 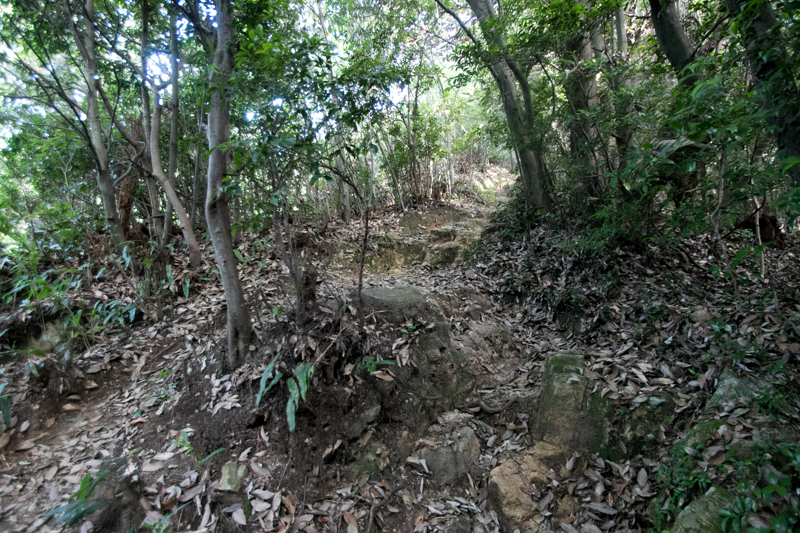 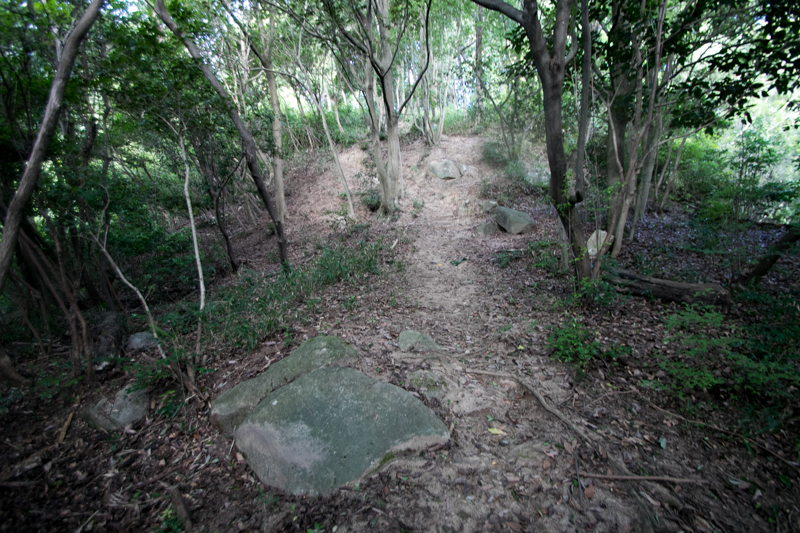 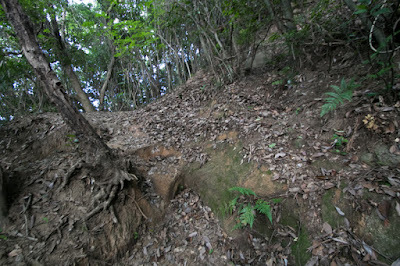 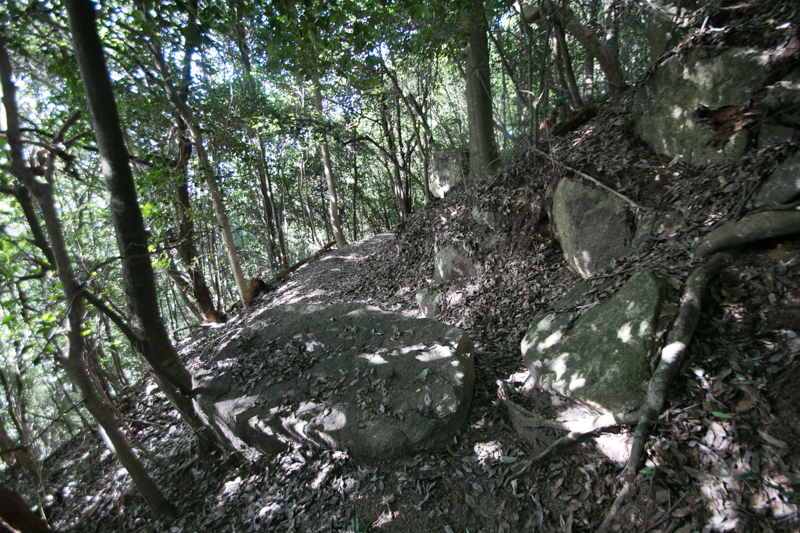 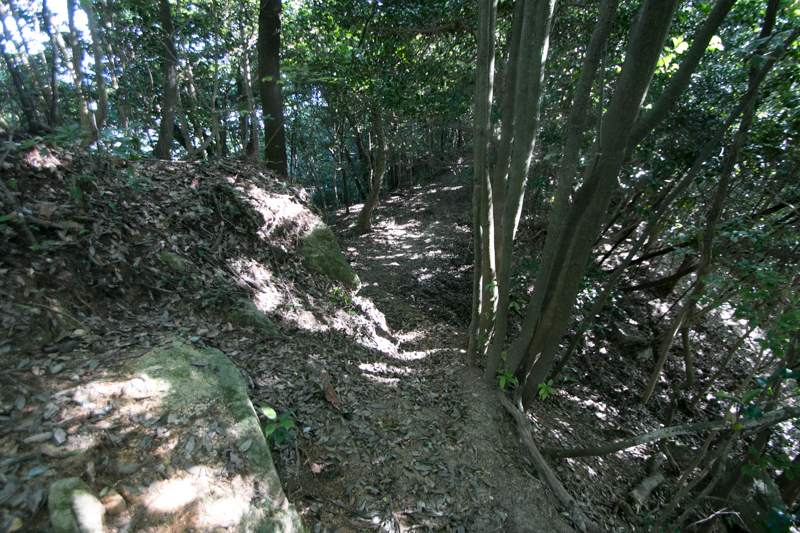 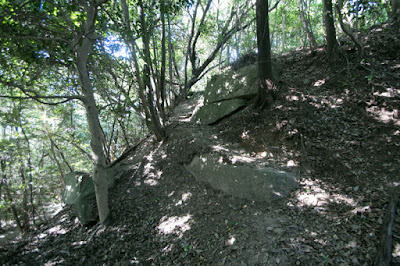 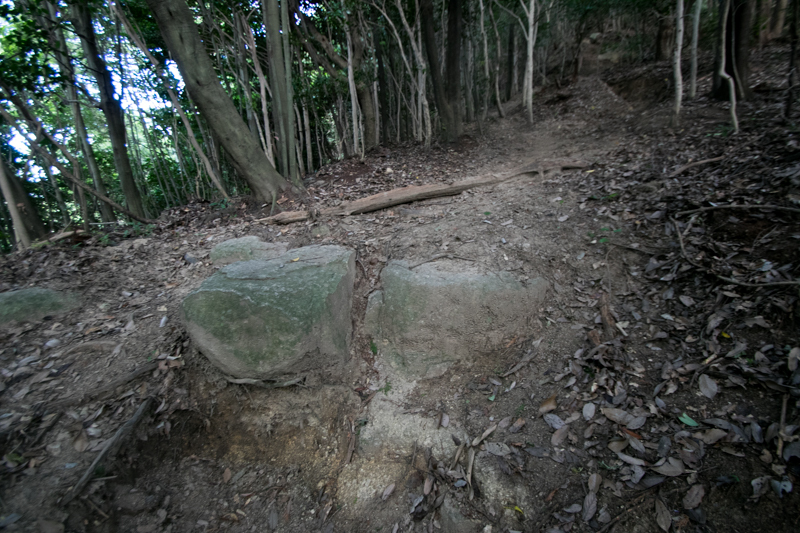 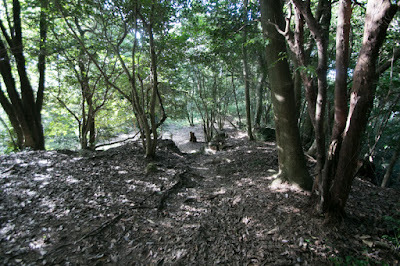 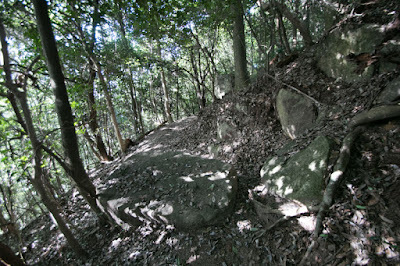 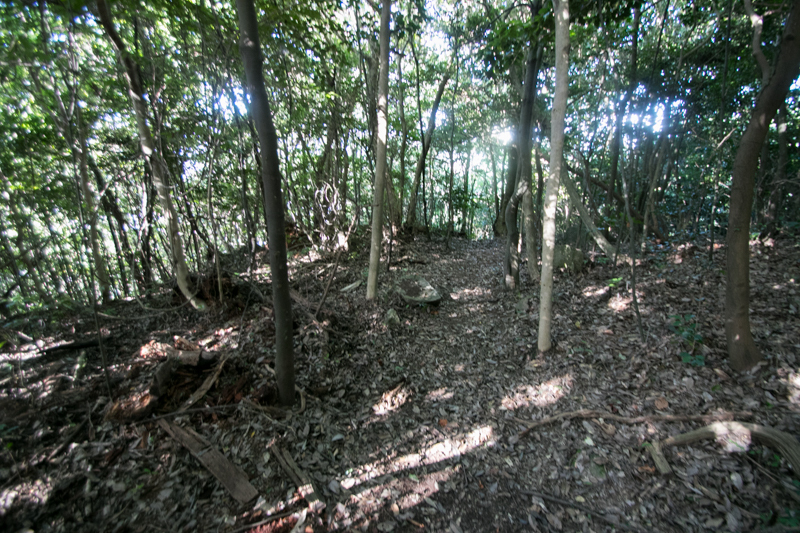 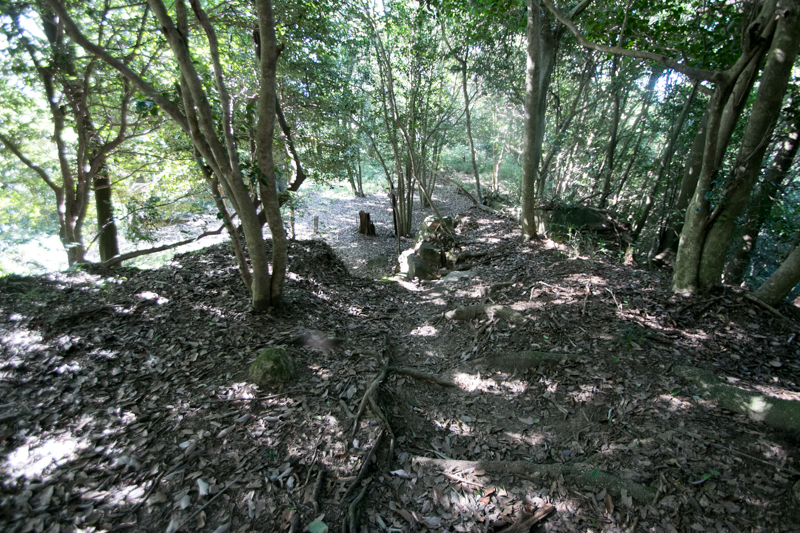 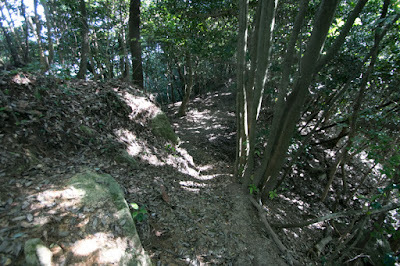 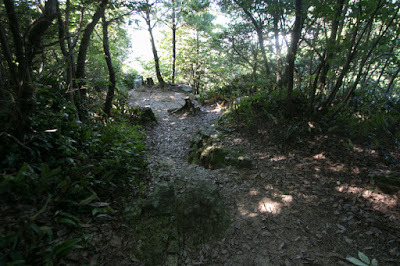 At the halfway there is a small terrace named Umagaeshi, which might be a forefront fort of the castle. 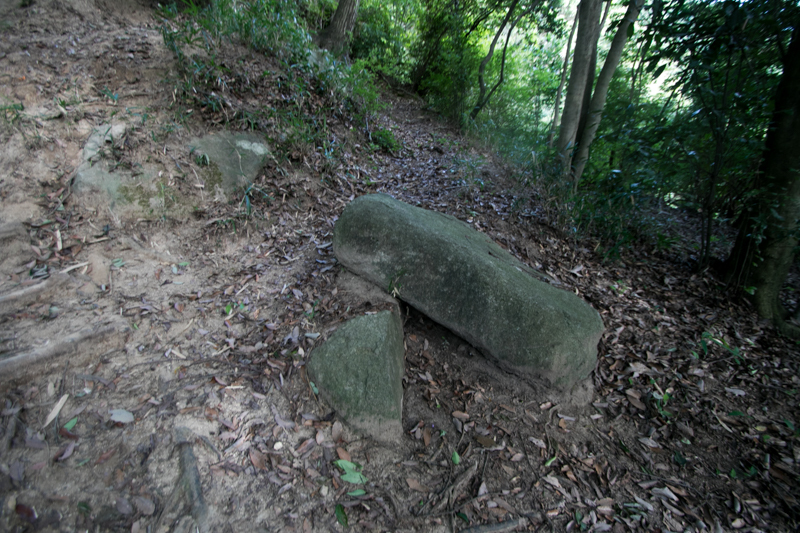 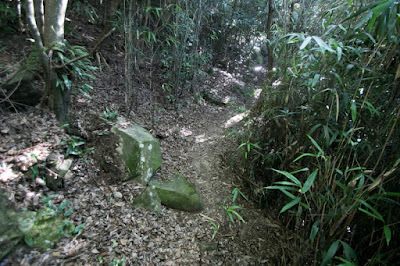 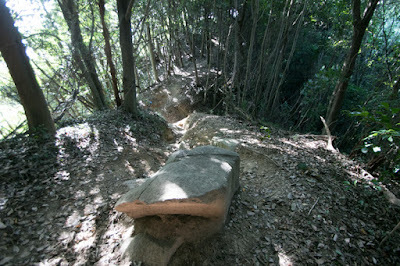 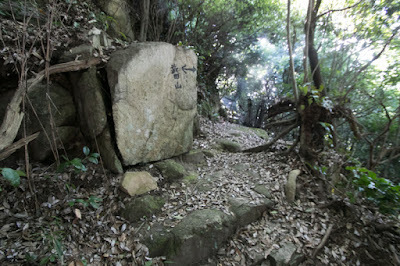 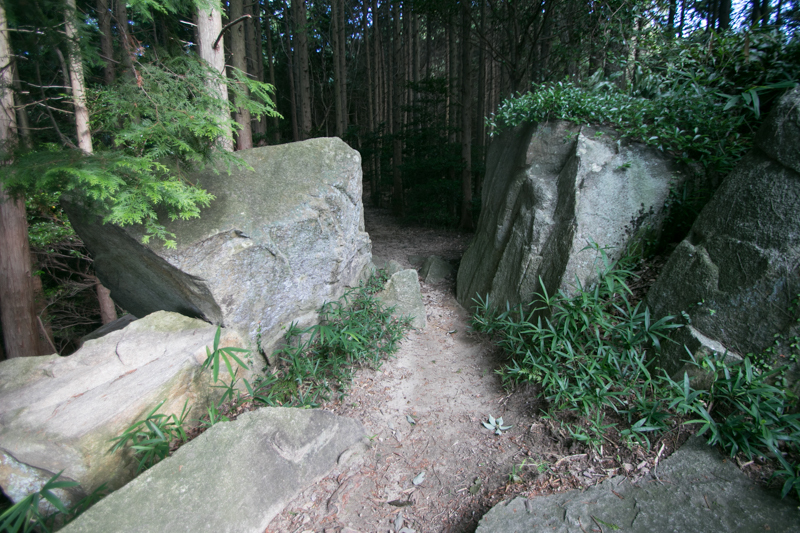 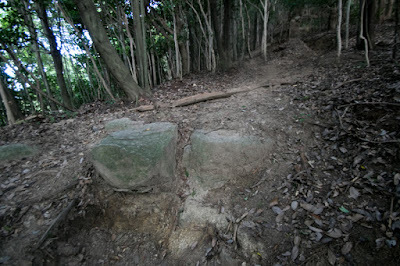 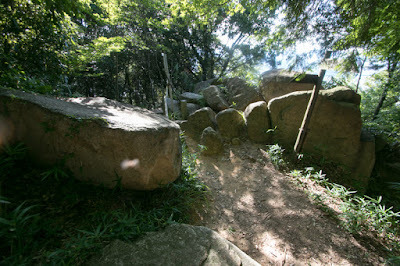 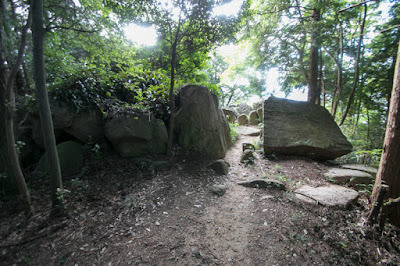 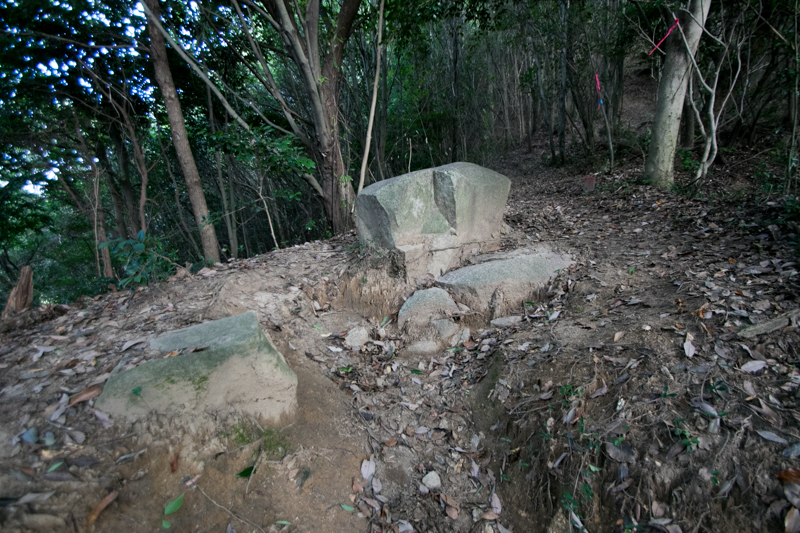 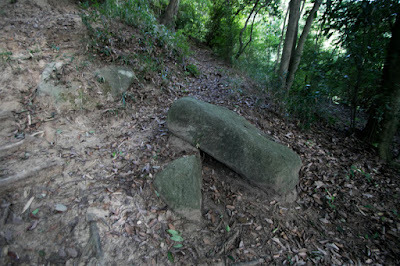 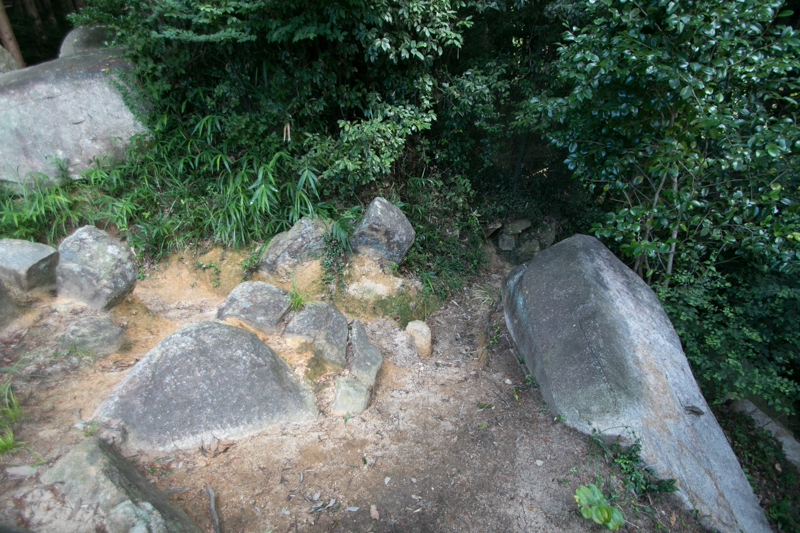 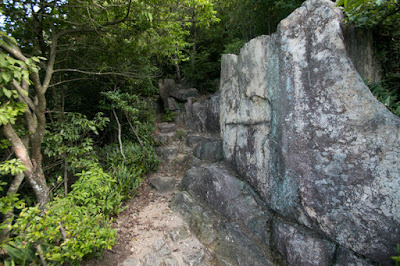 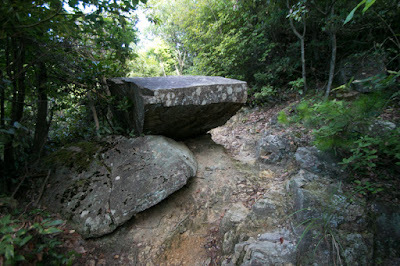 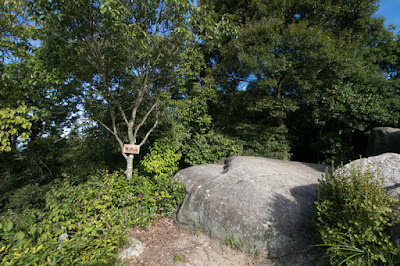 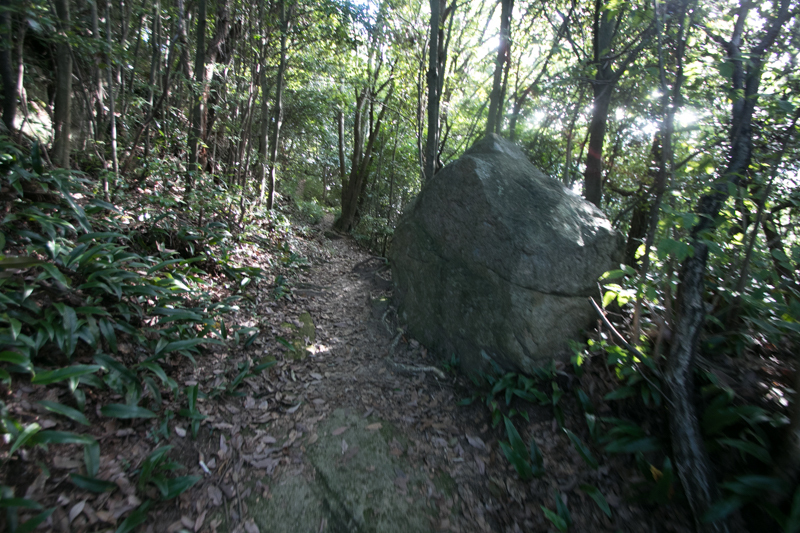 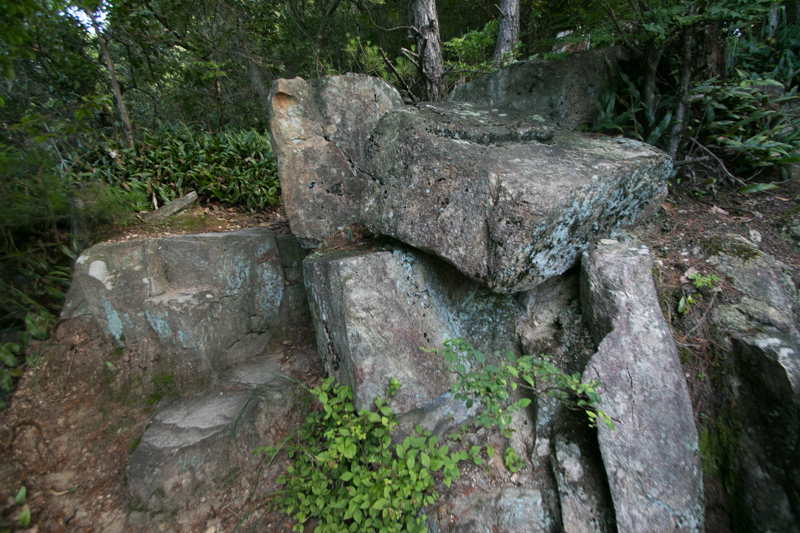 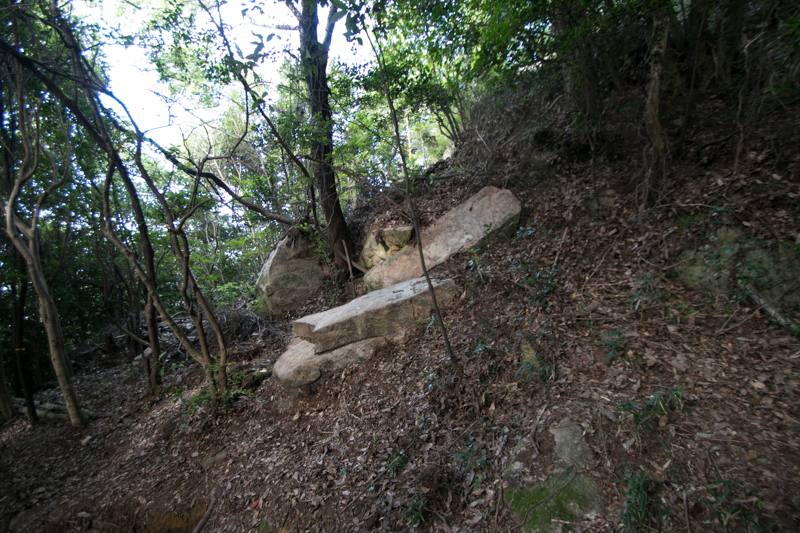 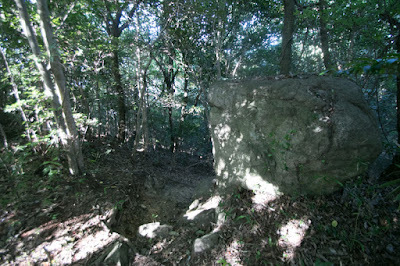 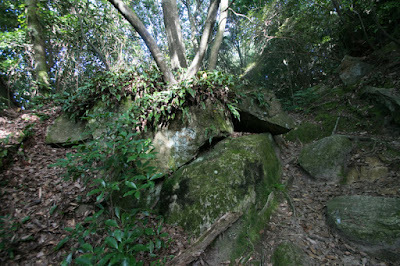 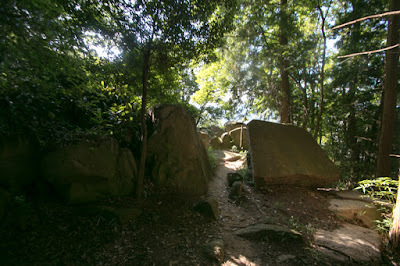 Above that there is a stone gate with folded path named Gomon. 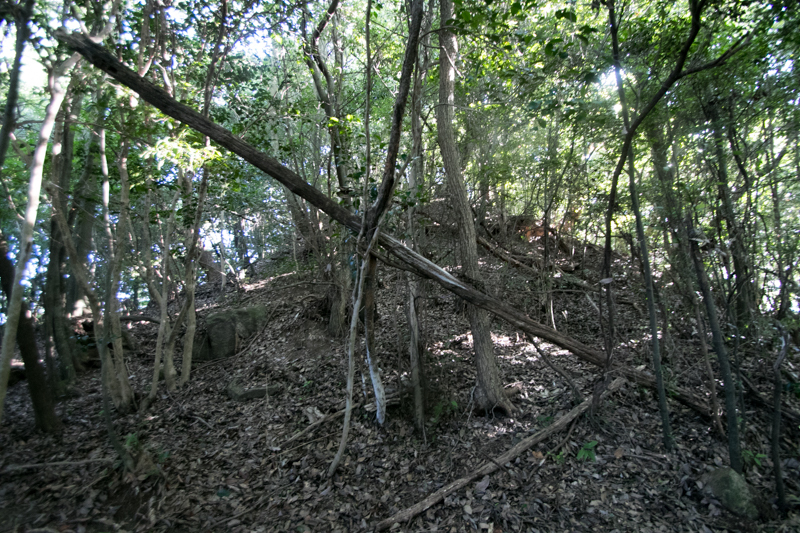 It is said as an origin of Masugata style complex gate with folded path, but it is clear if it is intentionally built or not. Ahead of this, just below central area there are several terraces which might be original structures of the castle. 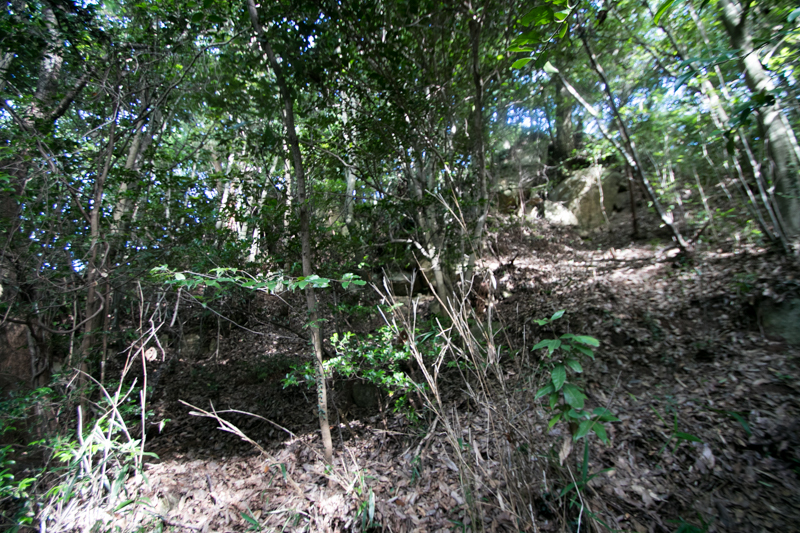 Total size of the castle is about 600 meter long and 400 meter wide, and its size and structure is becoming to the main base of the governor. 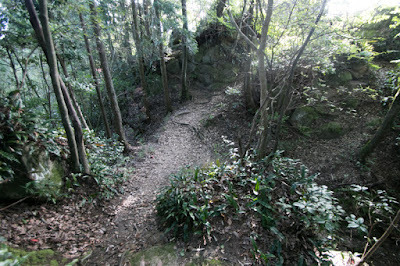 Aki Takeda clan which left Ouchi clan relied on this secure castle and tried to be independent supported by Amago clan, the warlord of Izumo province (Shimane prefecture) at Gassan Toda castle and the rival of Ouchi clan. 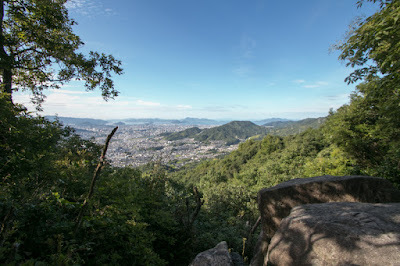 In response to this, Ouchi clan ordered Motonari Mouri (1497-1571), who was still a small local lord of Yoshida Koriyama castle (Hiroshima prefecture) under Ouchi clan, to compete with Aki Takeda clan. 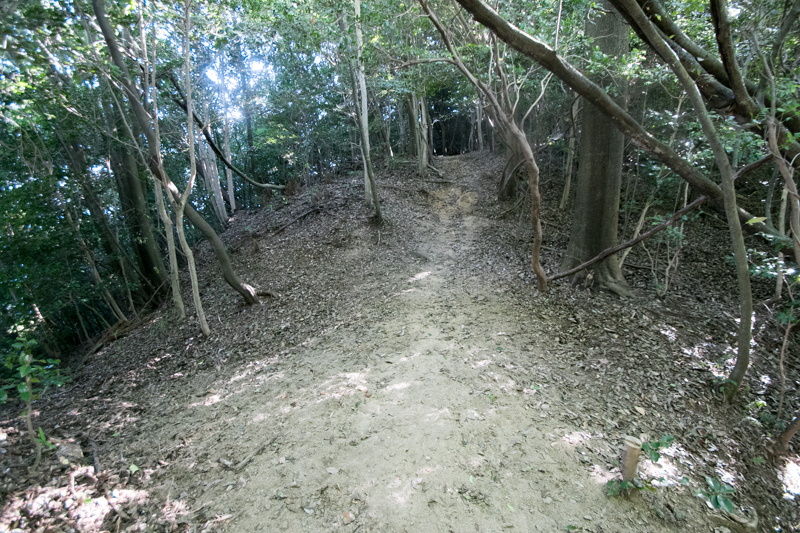 In 1517, Motoshige Takeda (1467-1517), the leader of Aki Takeda clan, sent his army with his general Motonao Kumagai (?-1517) toward Arita castle deprived by Mouri clan. Aki Takeda clan had far larger army than Mouri clan, but their vanguard Motonao Kumagai was shoot by Mouri army in the confused fight and died. 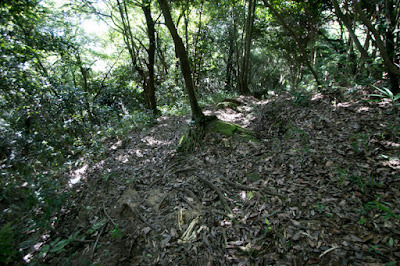 Furious Motoshige Takeda charged into Mouri army with all troops, but Mouri army stood the attack of dominant Takeda army then also shoot Motoshige Takeda who tried to cross the river. 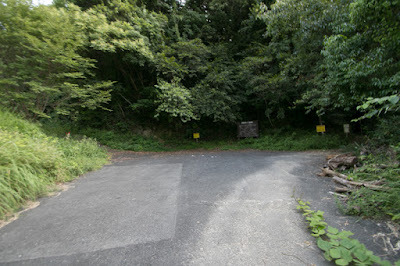 Aki Takeda clan lost its leader and major general, thus they significantly lost their authority. 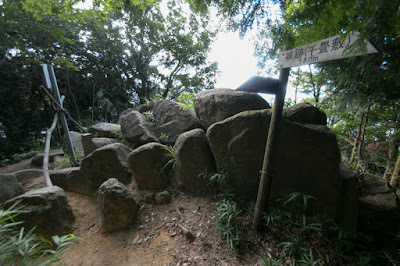 On the other hand, Motonari Mouri won the fame which supported later rise of Mouri clan. 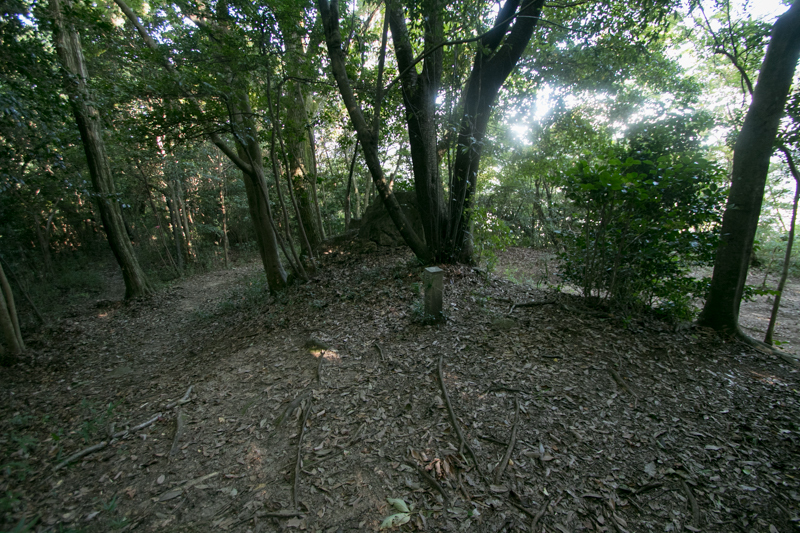 After that Aki Takeda clan faced against Mouri clan over 20 years, but in 1541 Amago army failed to the siege of Yoshida Koriyama castle which was the main base of Motonari Mouri, and suffered severe damage by the chase of Takafusa Sue (1521-1555), the general of Ouchi army. 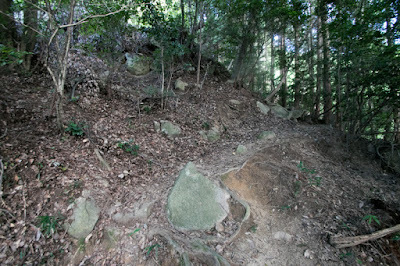 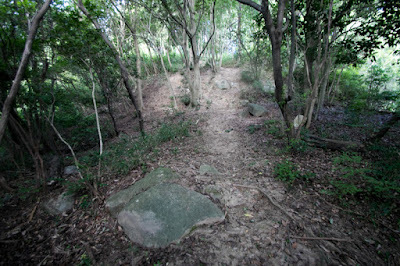 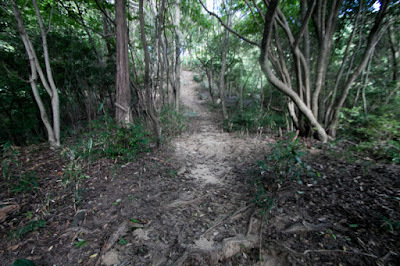 Looking at this defeat the leader of Aki Takeda clan left Sato Kanayama castle, and the castle was seized by Ouchi clan. Ouchi clan placed Takatoyo Reizei (1513-1551), a brave and loyal general, as the commander of castle. At the fall of Aki Takeda clan, one relative of Takeda clan survived and became priest then named as Ekei Ankokuji (1539?-1600). 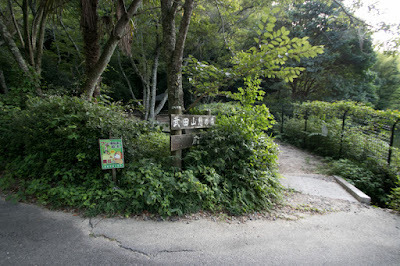 Ekei became a high class priest, and also activated as a diplomat of Mouri clan. 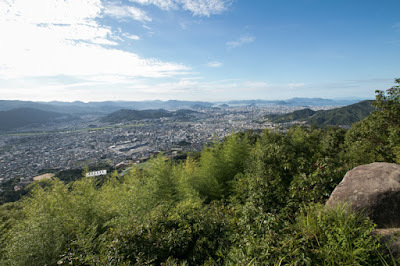 It is said that Ekei predicted sudden fall of central ruler Nobunaga Oda (1534-1582), and proceeded an alliance of Mouri clan and next ruler Hideyoshi Toyotomi (1537-1598). 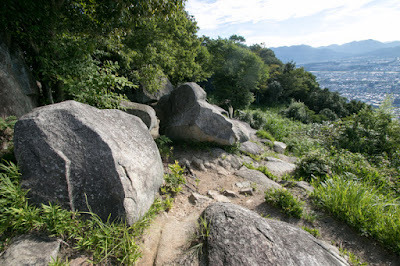 After the death of Hideyoshi, at the conflict of Ieyasu Tokugawa (1543-1616), the largest lord under Toyotomi government, and Mitsunari Ishida (1560-1600), the chief administrative staff of Hideyoshi, Ekei became the major participant of Ishida side. 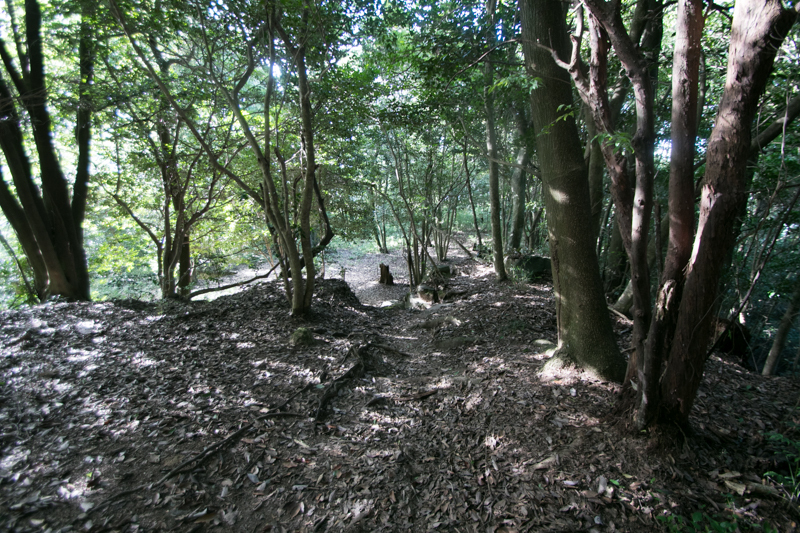 Ekei involved Mouri clan into Ishida side, but because of opposition Mouri army did not act at the decisive battle of Sekigahara. After the lost of the battle Ekei was executed with Mitsunari by Ieyasu. 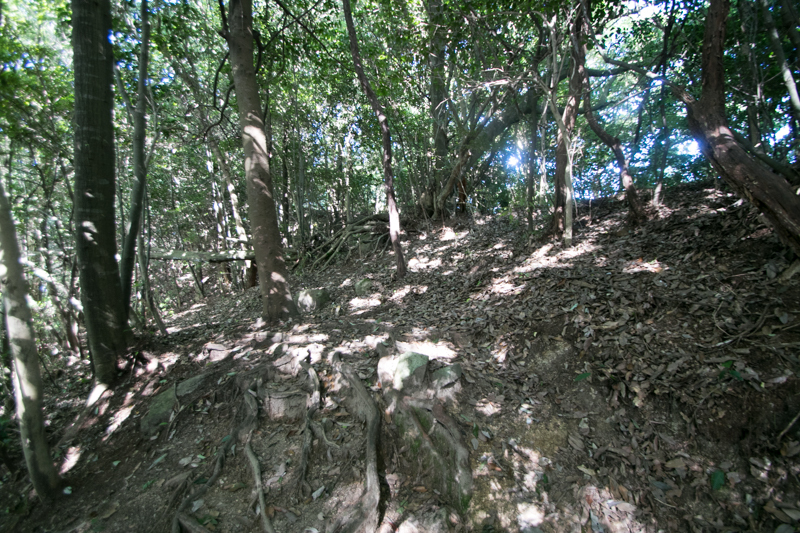 Sato Kanayama castle was kept by Ouchi clan and Sue clan which ruined Ouchi clan in 1551, but after the battle of Itsukushima in 1555 Mouri clan finally captured this castle. Motonari Mouri used this castle as a retirement place to manage captured current Hiroshima city area, but it is unclear if aged Motonari Mouri actually climbed to such a high place or not. 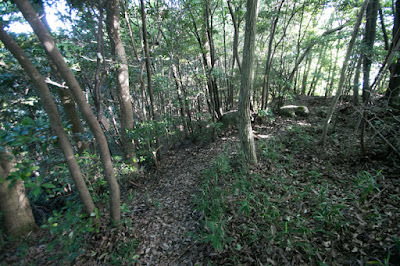 In 1590, Mouri clan newly built Hiroshima castle (Hiroshima castle) directly at the mouth of Ota-gawa river. 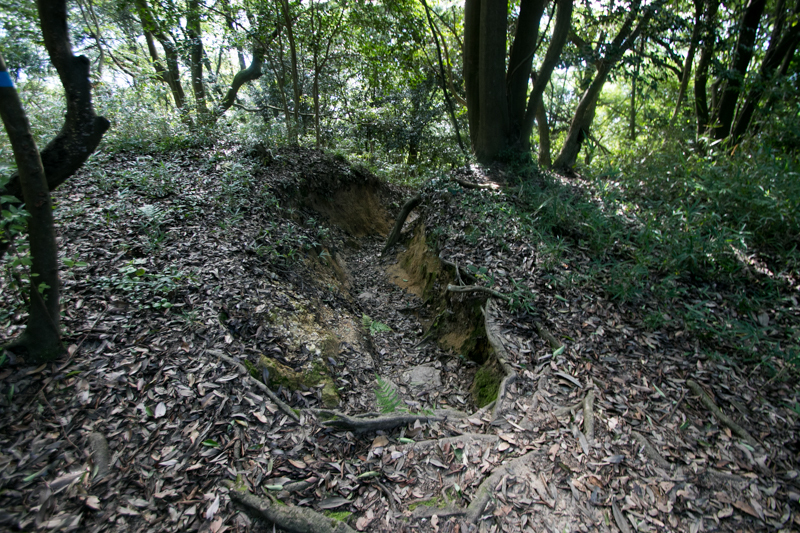 It is said that Sato Kanayama castle was abolished at this time, but considering small and plain structure of Hiroshima castle, Sato Kanayama castle might be kept as a last bastion. Anyway in 1600 Mouri clan lost Aki province as a result of the battle of Sekigahara, and next lord Fukushima clan did not use this castle any more. 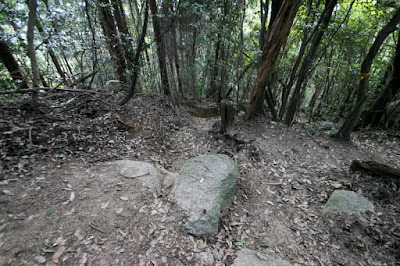 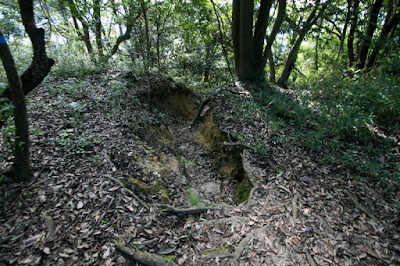 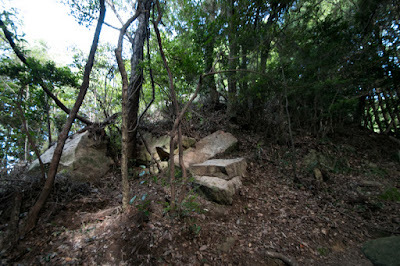 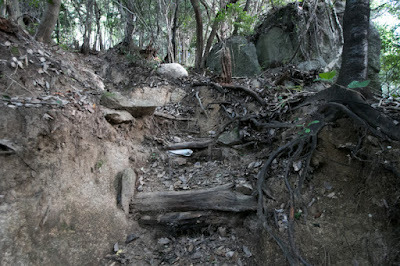 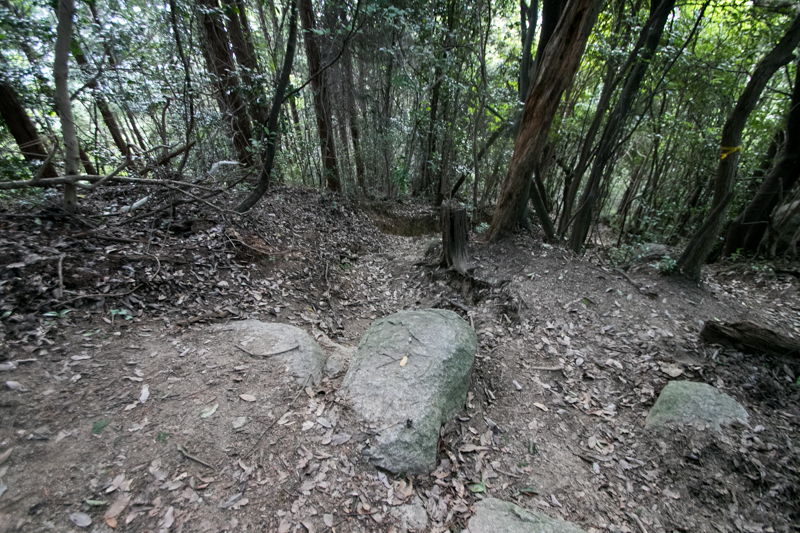 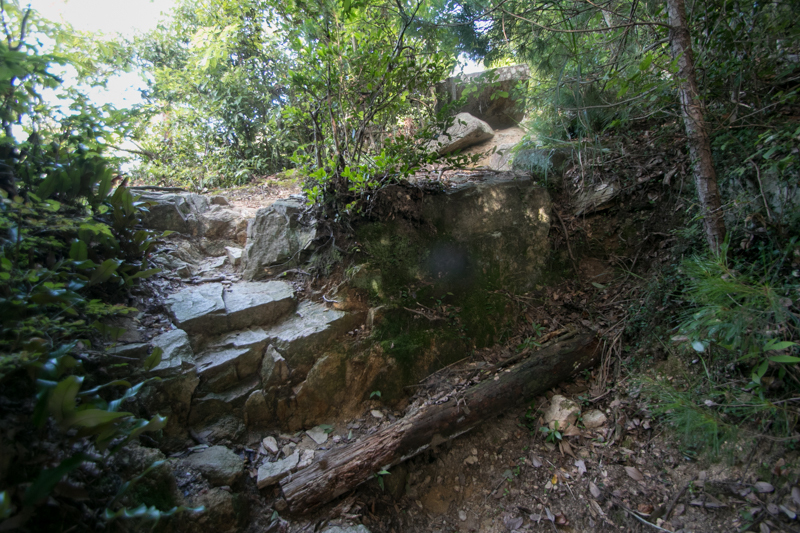 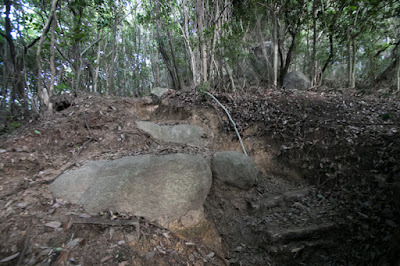 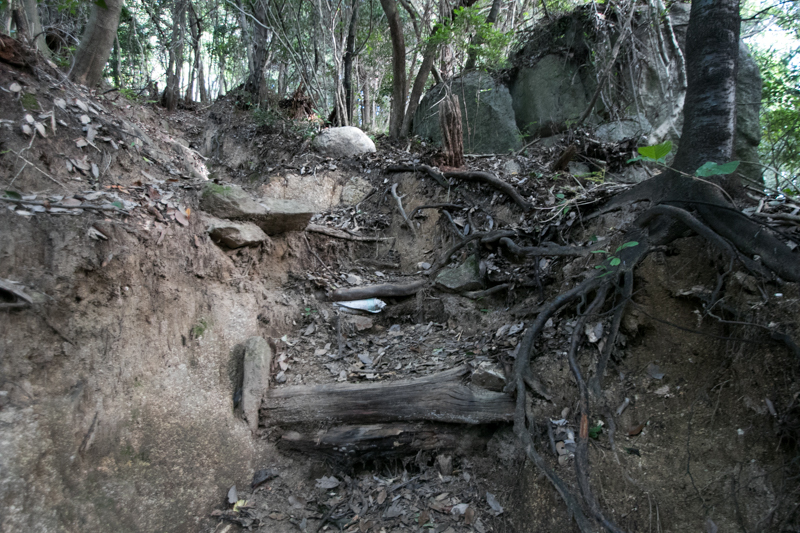 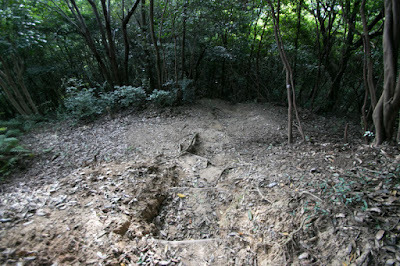 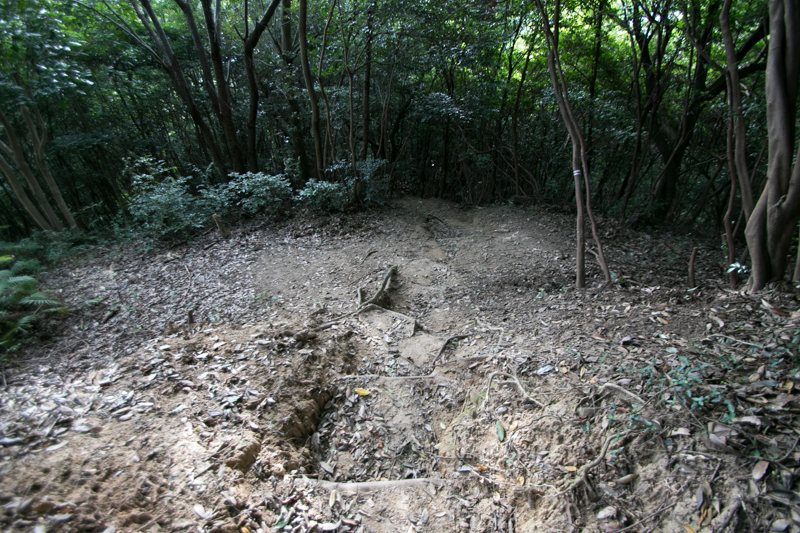 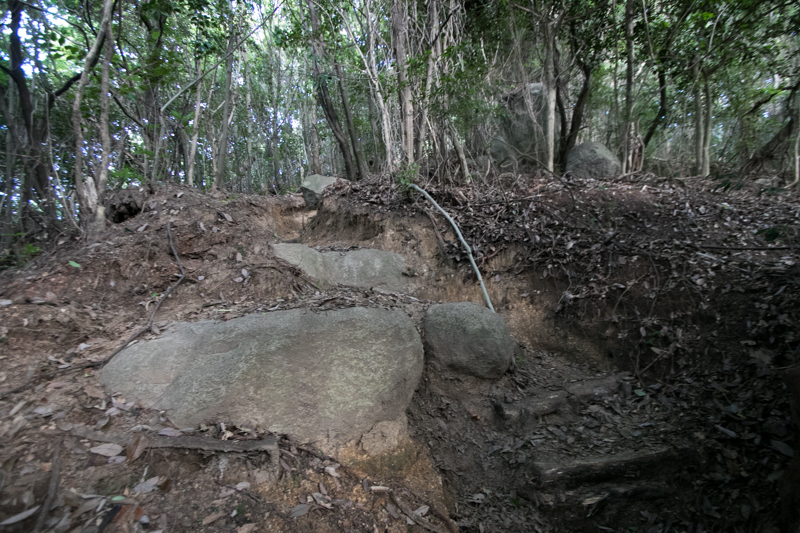 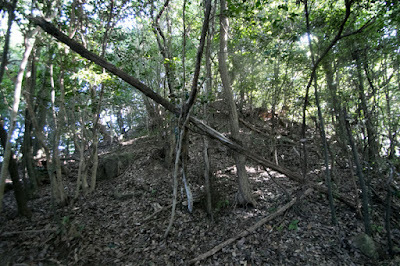 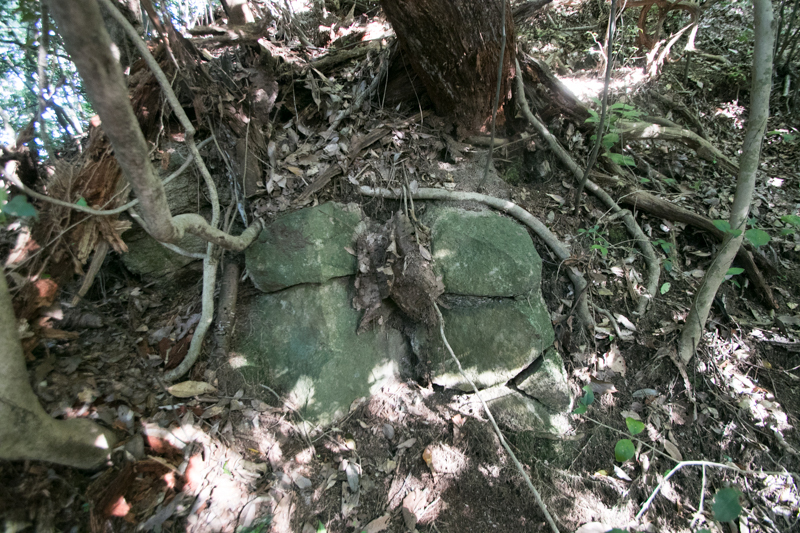 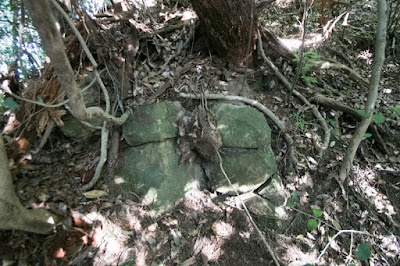 Now all building was lost but structures of the castle well remain on the mountain. 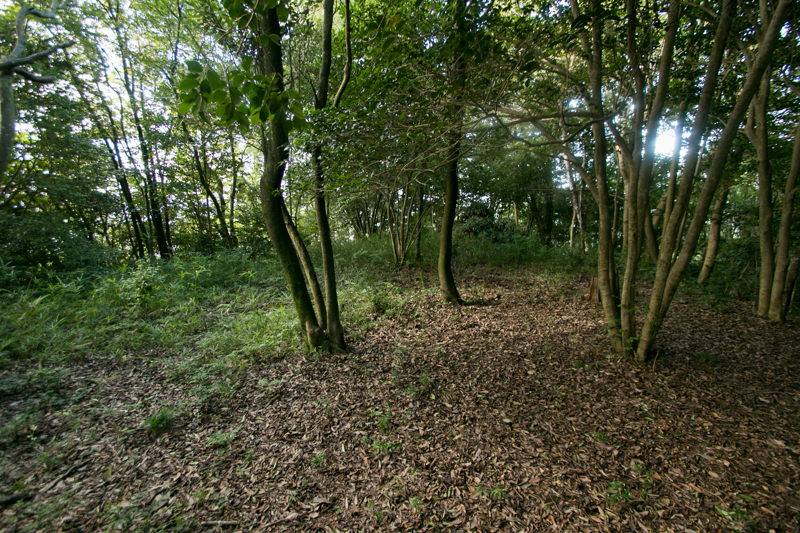 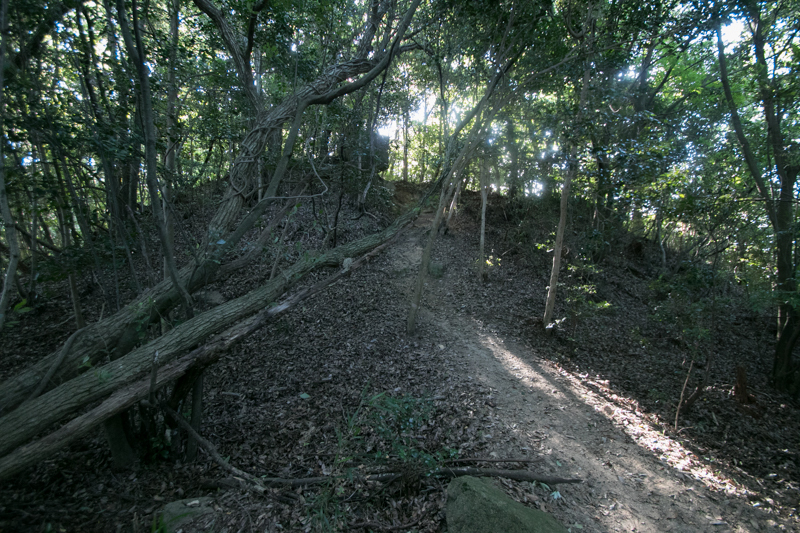 The castle site has an atmosphere of natural and wild, and this is also the image of Aki Takeda clan which was traditional and brave but could not evolve into the warlord by one step. 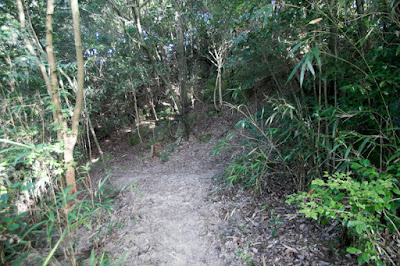 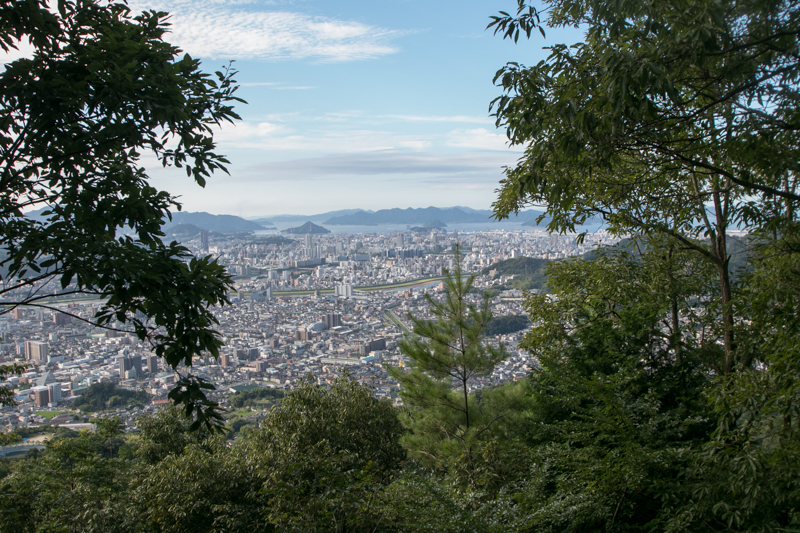 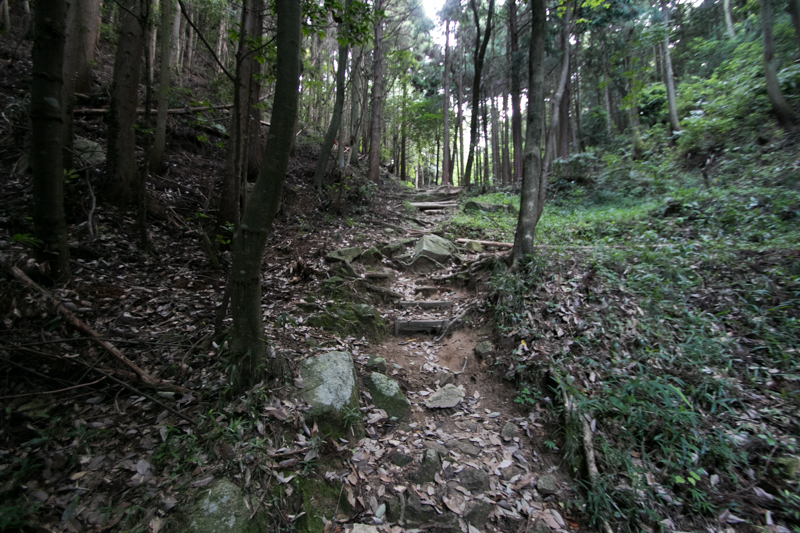 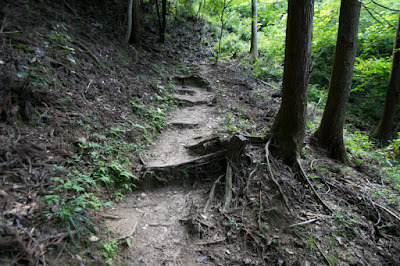 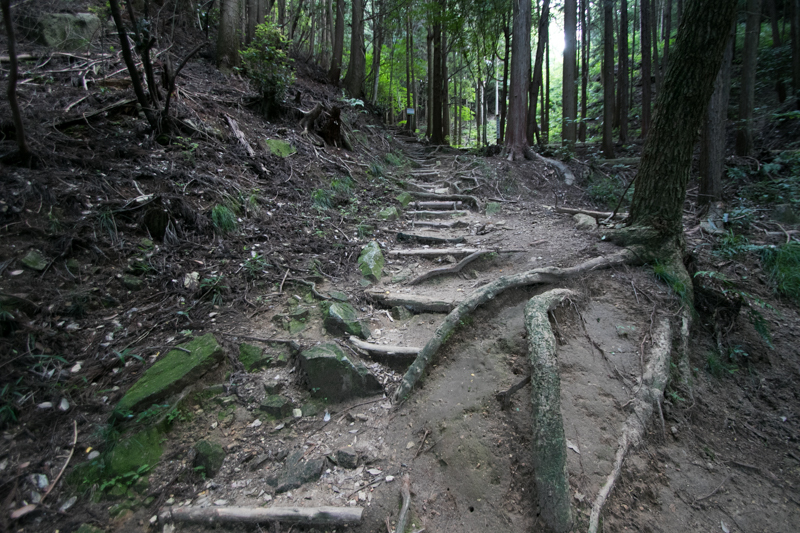 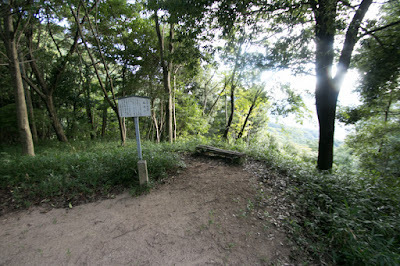 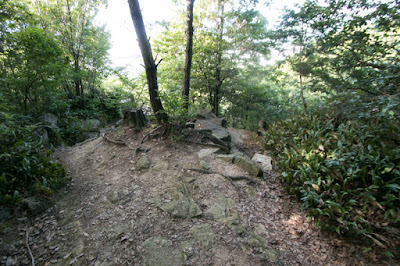 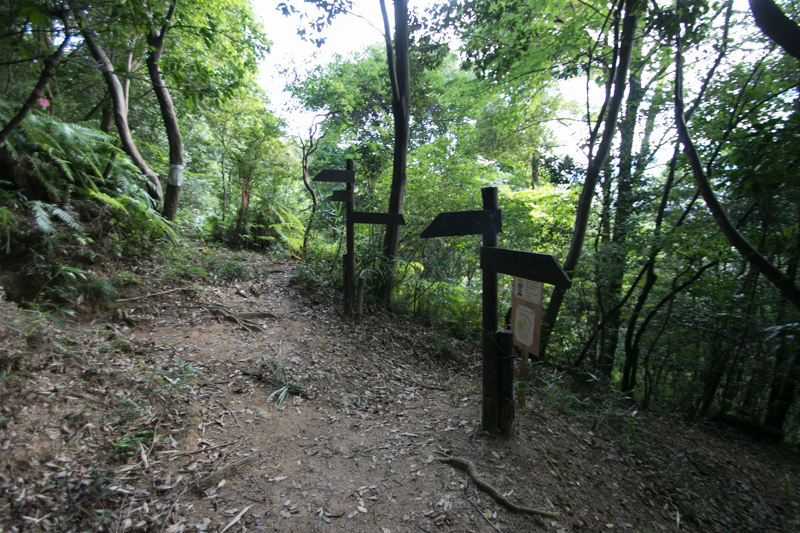 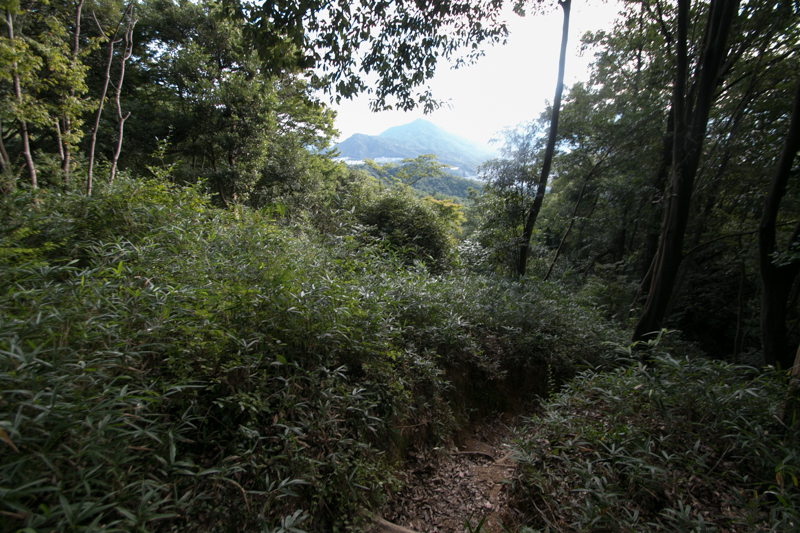 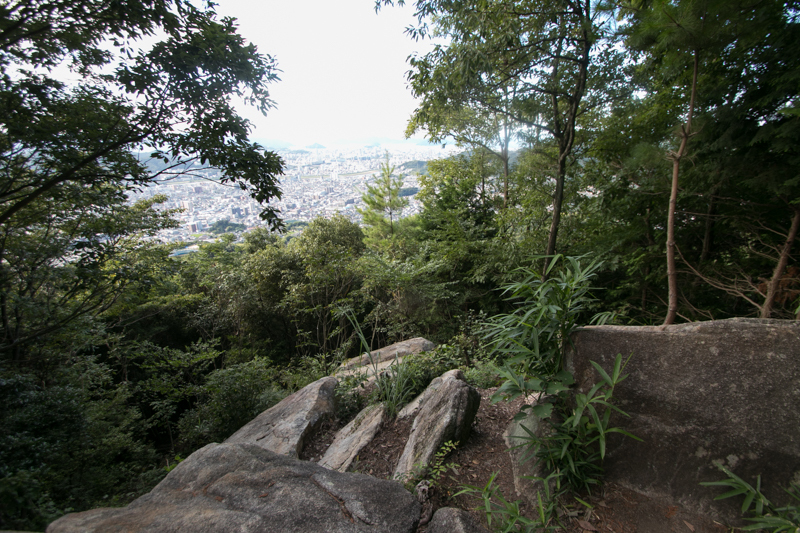 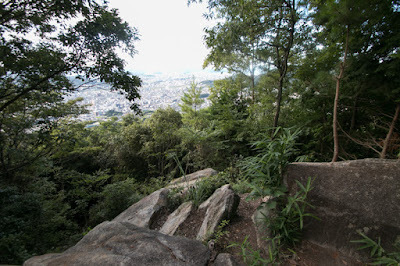 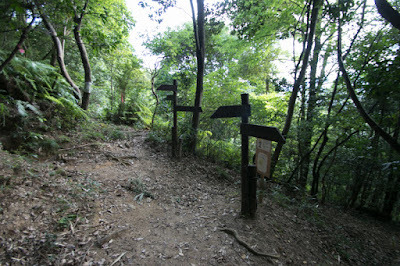 Now good scenery of the mountain unchanged from 500 years ago enjoys many hikers. 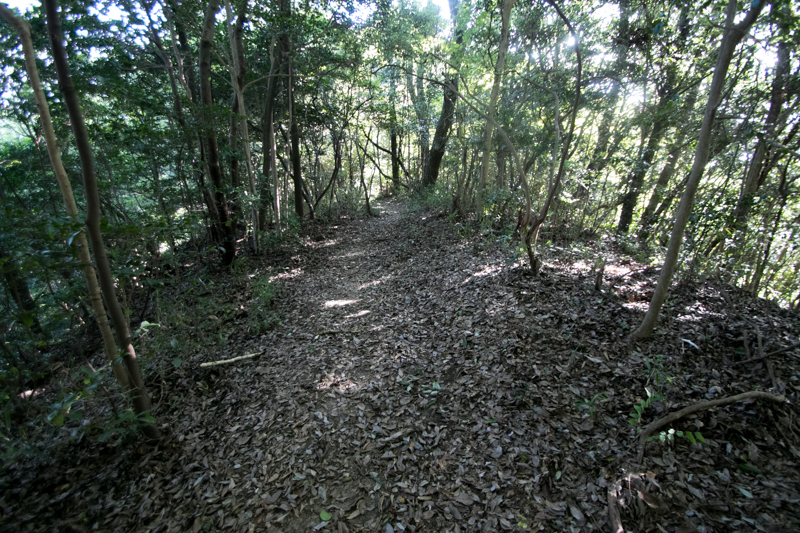 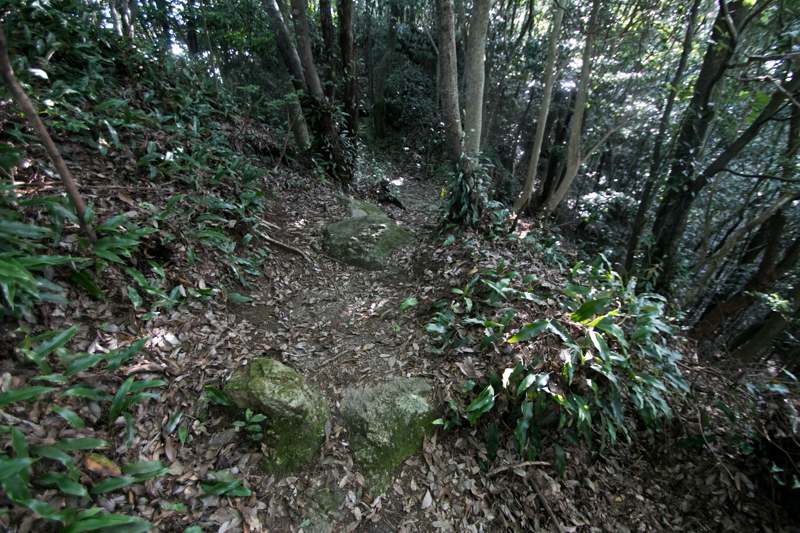 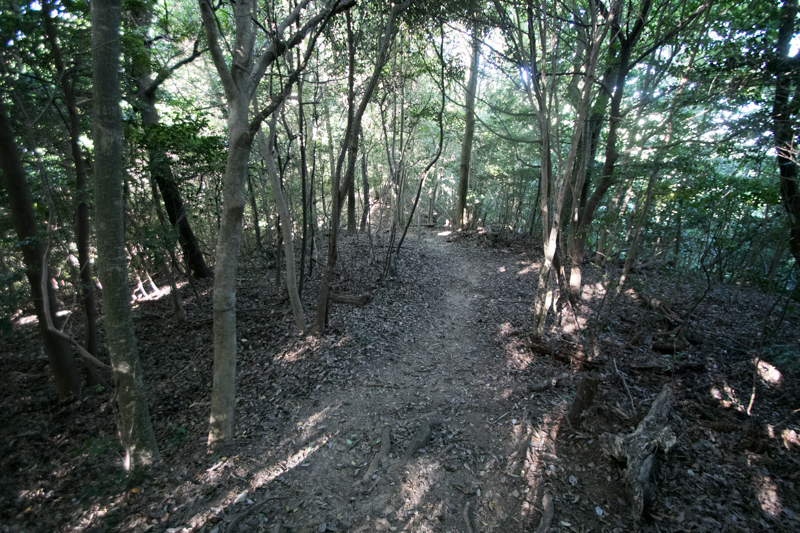 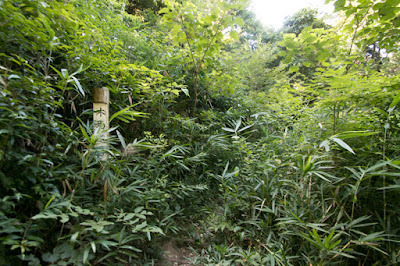 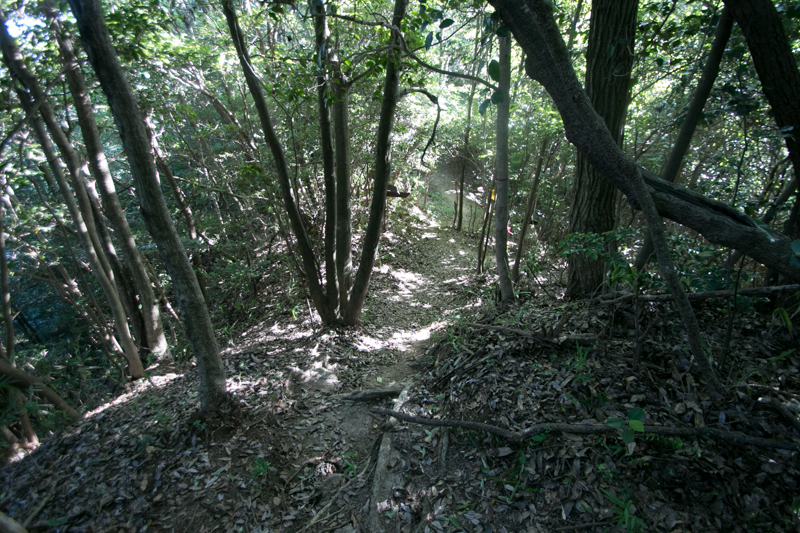 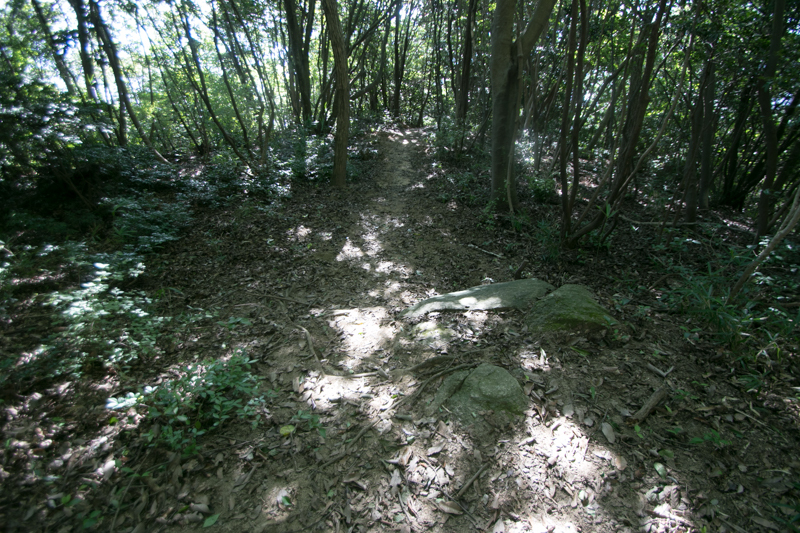 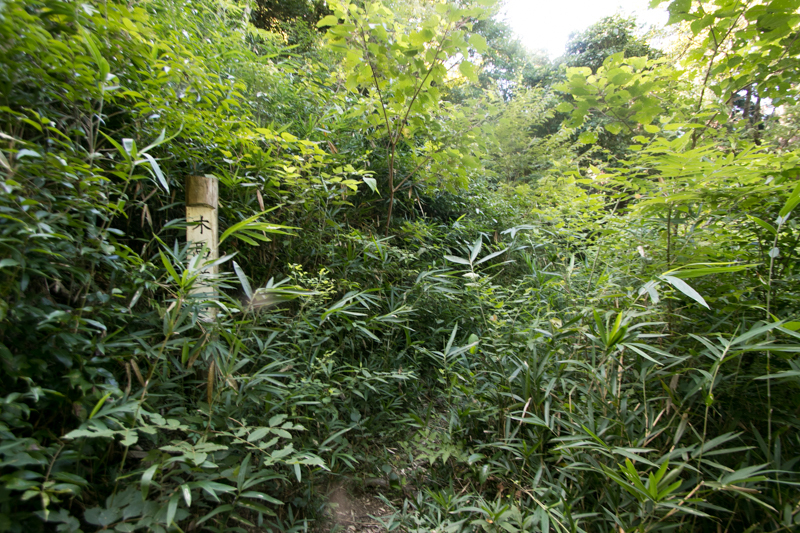 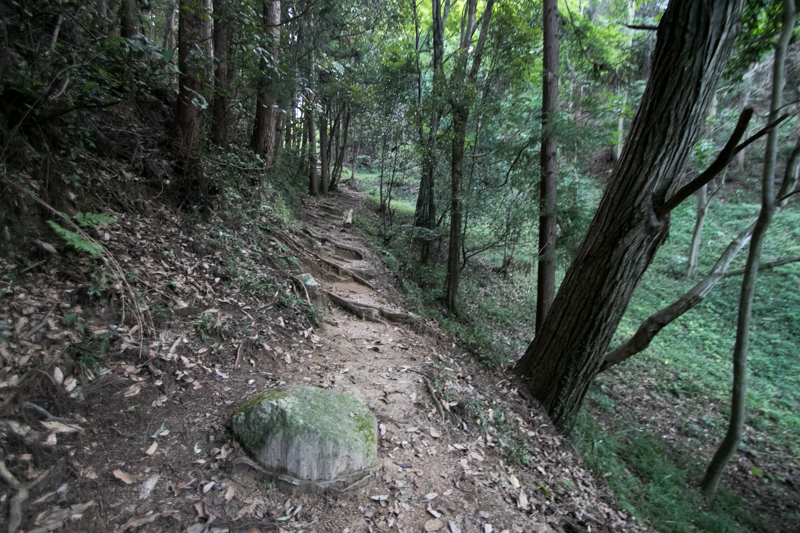 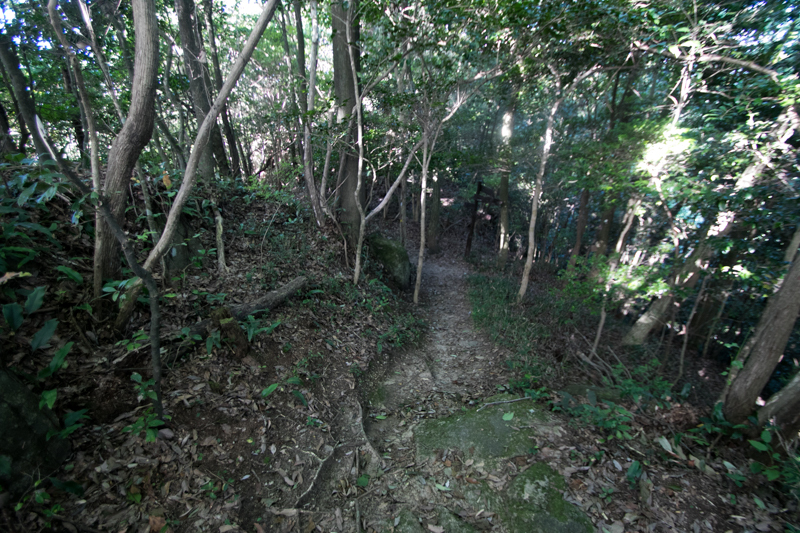 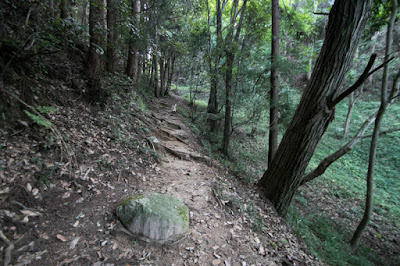 30 minutes walk from JR West Kabe-sen line Shimo-Gion station to entrance of climbing road at Ikoi-no-Mori park. 30 minutes drive from Sanyo Jidoshado Expressway Hiroshima interchange to the parking of the park but be careful to narrow access road. 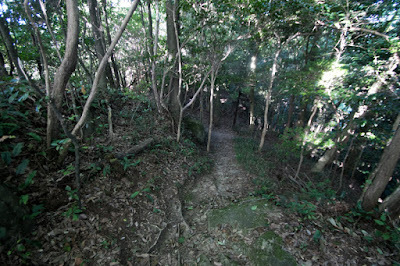 40 minutes walk from entrance of climbing road to hilltop castle.